So here we are, finally. 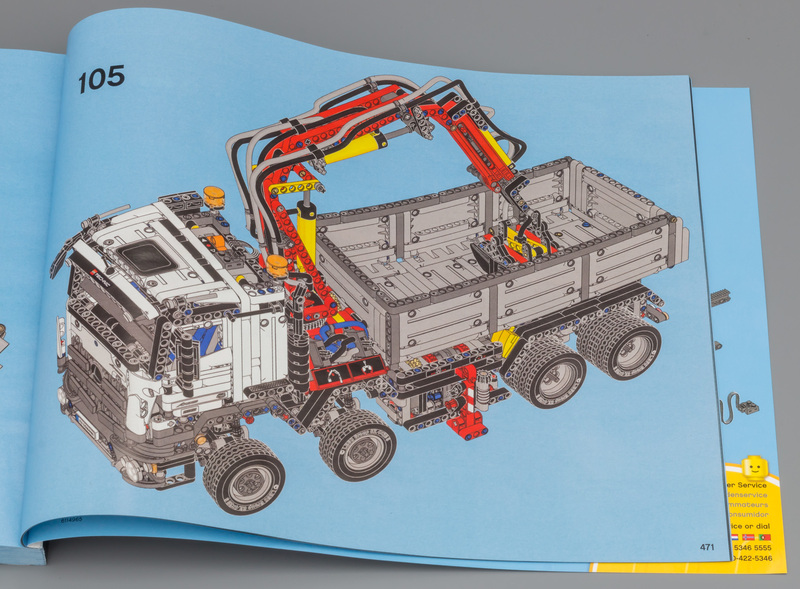 Last year the Volvo review was published at the beginning of June, so you all needed to wait a little bit longer for this one. 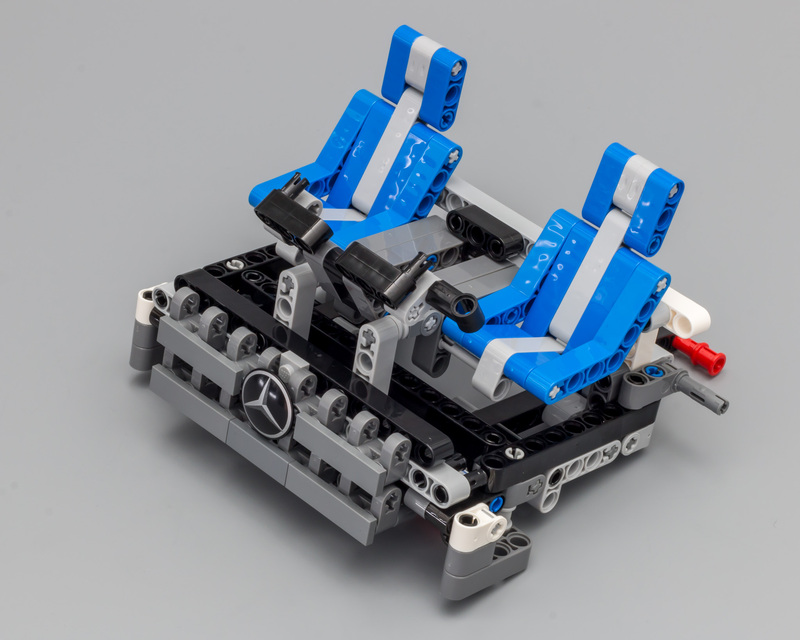 Rumors started early December of a licensed Mercedes set. What could it be, a truck, a car? 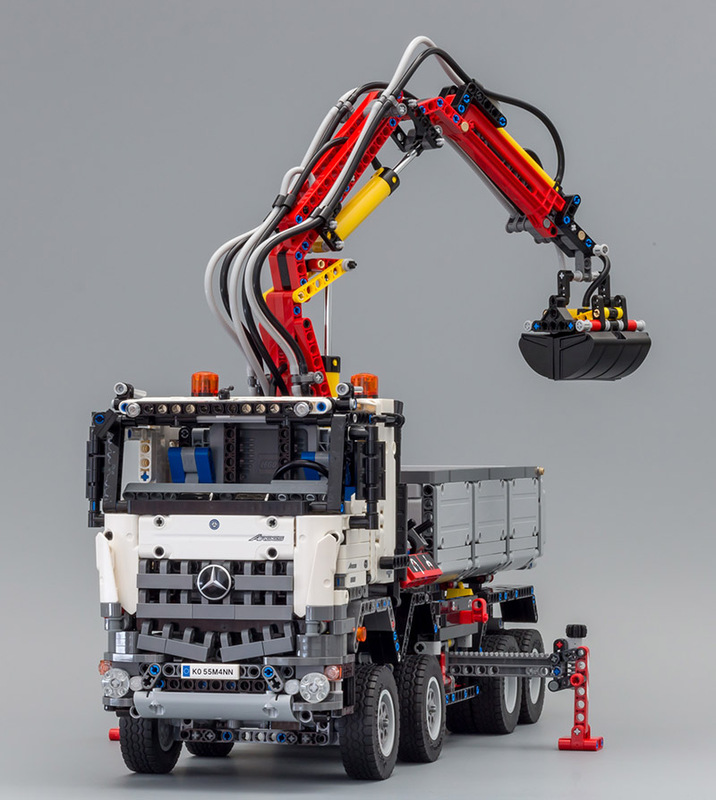 Christmas Eve revealed the LEGO Technic 42043 Mercedes-Benz Arocs 3245. The eager anticipation of news about a new model always has its special moments. This time Paul (Boratko) had seen a first glance of the model. This resulted in one or two questions being asked. What's the color scheme? 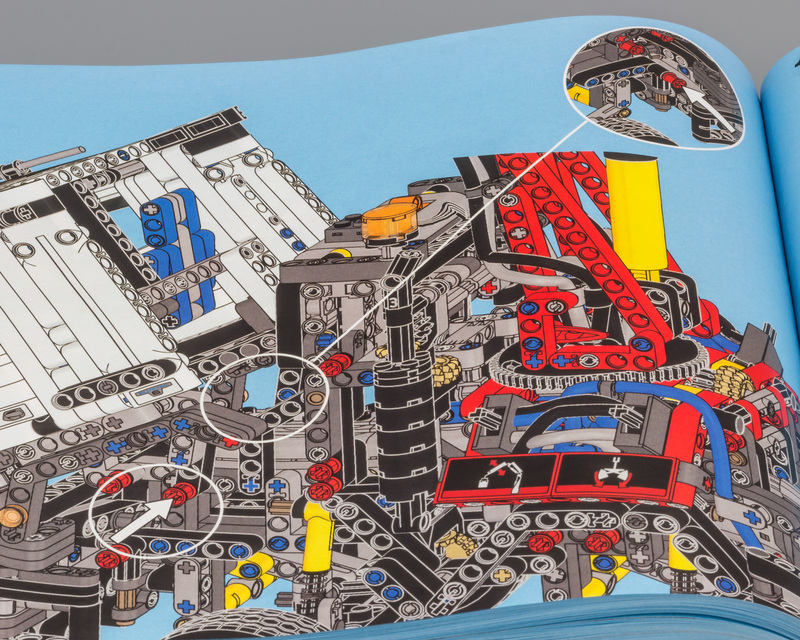 Does it have pneumatics? 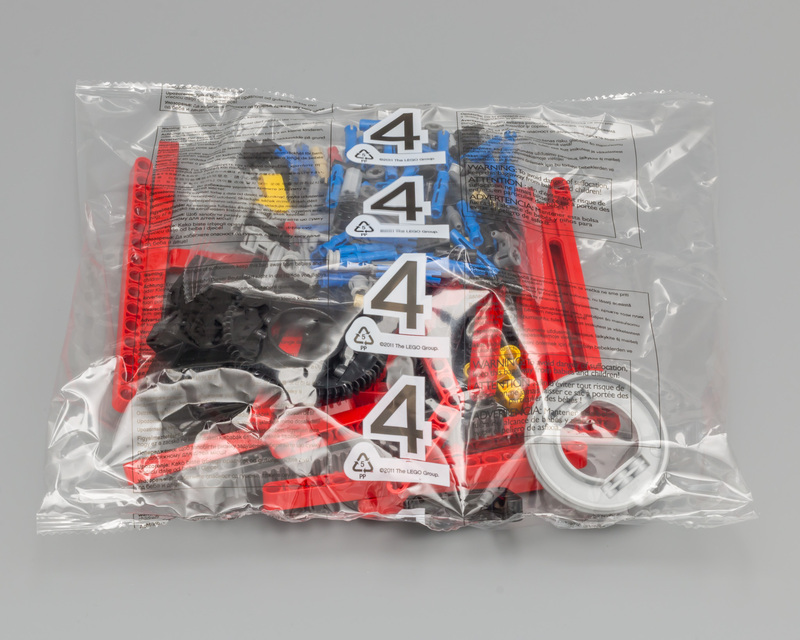 Does it have new pneumatic parts? Does it have double wheels on the rear axles? Does it have front suspension? Does it have this, does it have that? 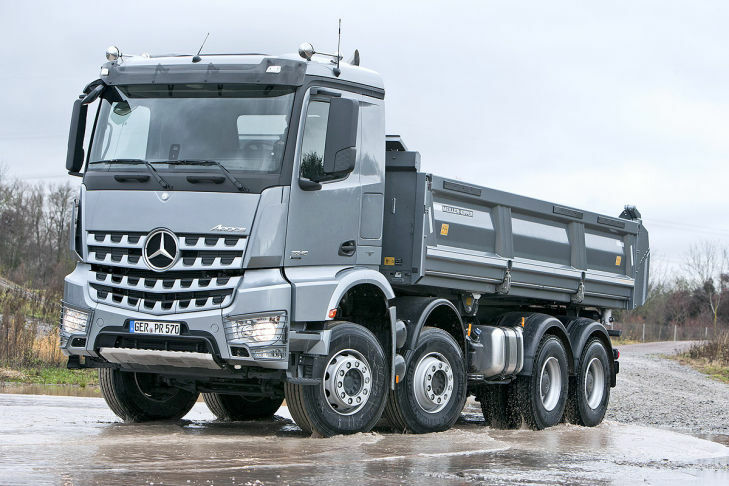 It's safe to say that Markus has some experience when it comes to designing trucks. At the beginning of each stage, I state how long it took me to finish it. 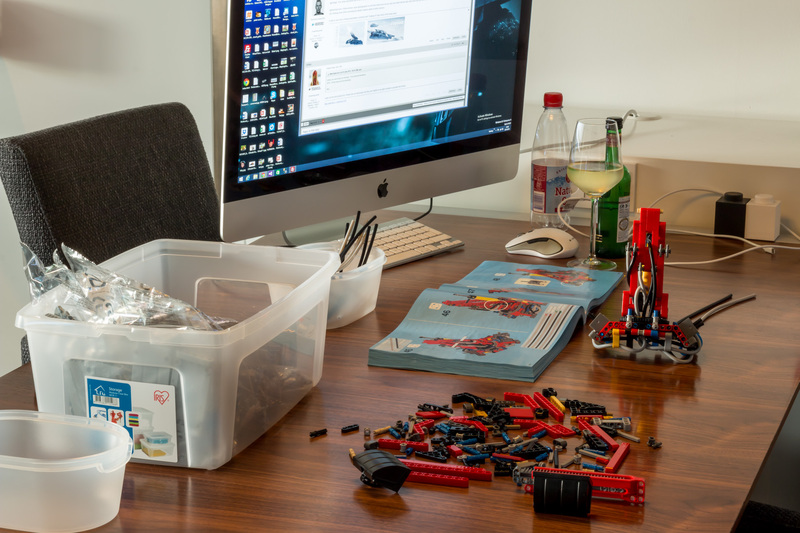 Mind you, that when I'm building for a review, I lose a lot of time shooting pictures. So your building time will probably be 70% to 80% of my time. Note: Pictures, taken with a Canon 70D with 50mm Canon prime lens, can be clicked for hi-res versions. The box is the same size as last year's 42030 - Volvo L350F (review). It's huge and it's heavy. 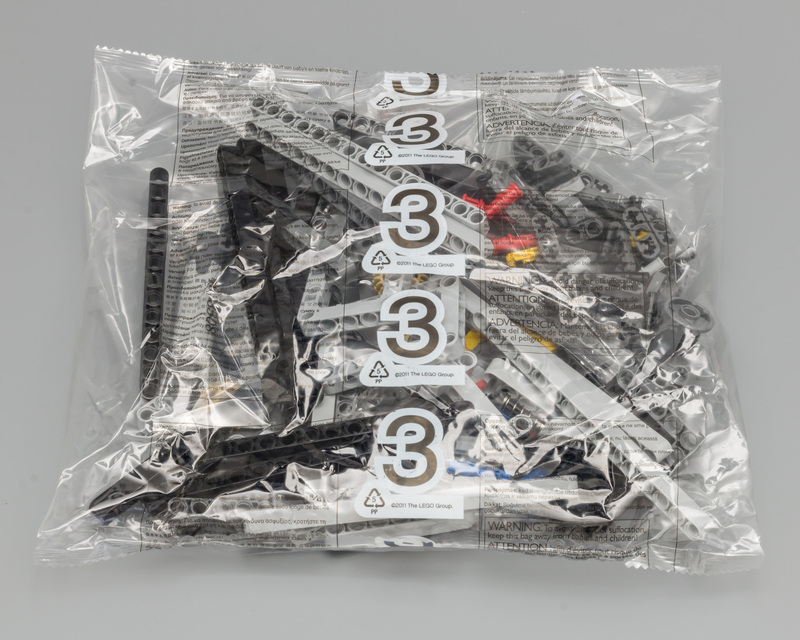 Weighing in at almost 4,5kg, this actually does feel like the biggest Technic set ever. Unfortunately my box was severly damaged upon delivery. Even the outer box was damaged, and looked like someone had opened it. 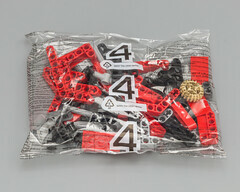 Luckily, the actual box was only damaged, instead of opened, so all the parts where still there. 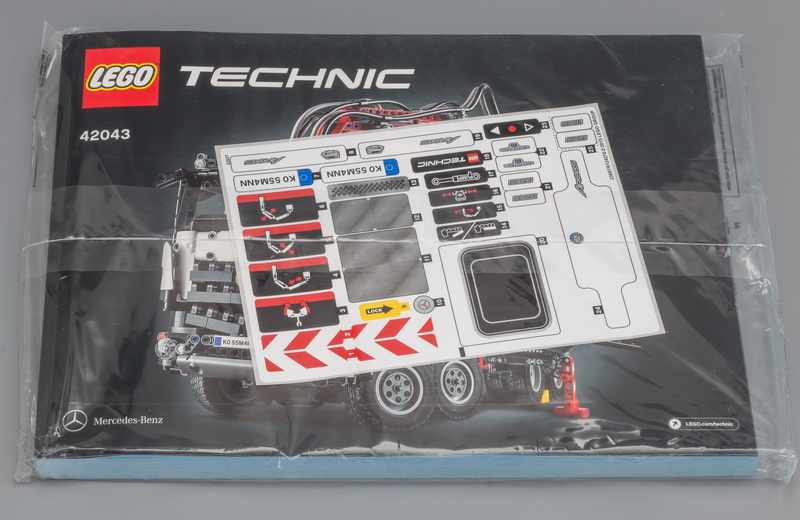 The front of the box shows the model (nothing new here), the Power Functions logo AND the new Pneumatics V2 logo. Hopefully we will see the last logo more often in future sets. 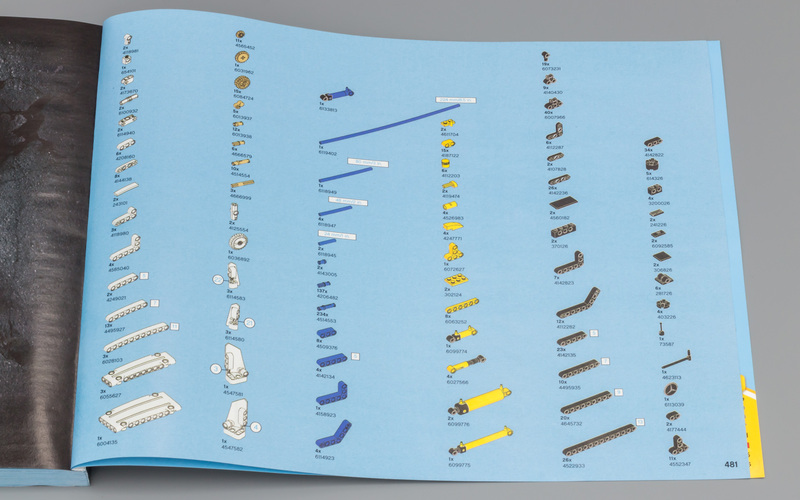 Under the Pneumatic logo, all new pneumatic parts are shown. 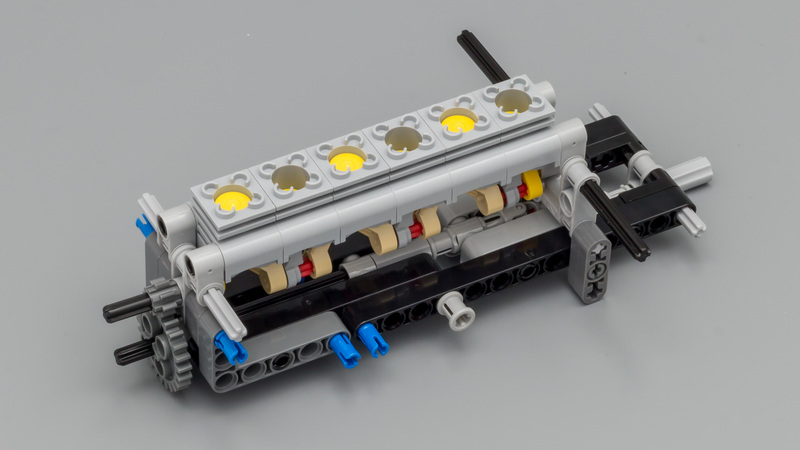 Three of the five parts are simply redesigned parts, but the two 11L cylinders (1x1 and 2x2) are brand new. 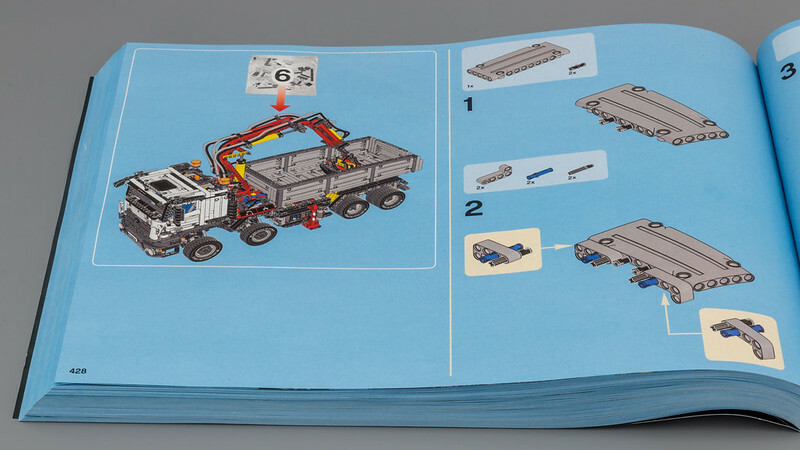 The inside of the box shows most of the features and functionality, combined with some fun facts about the real Arocs. 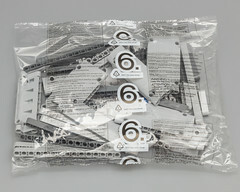 The model will measure 54 cm upon completion. 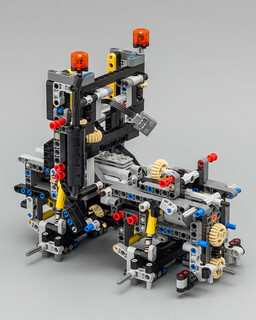 One of the sides shows the model and the two logos, while one of the other sides shows all the Pneumatic V2 and Power Functions parts. 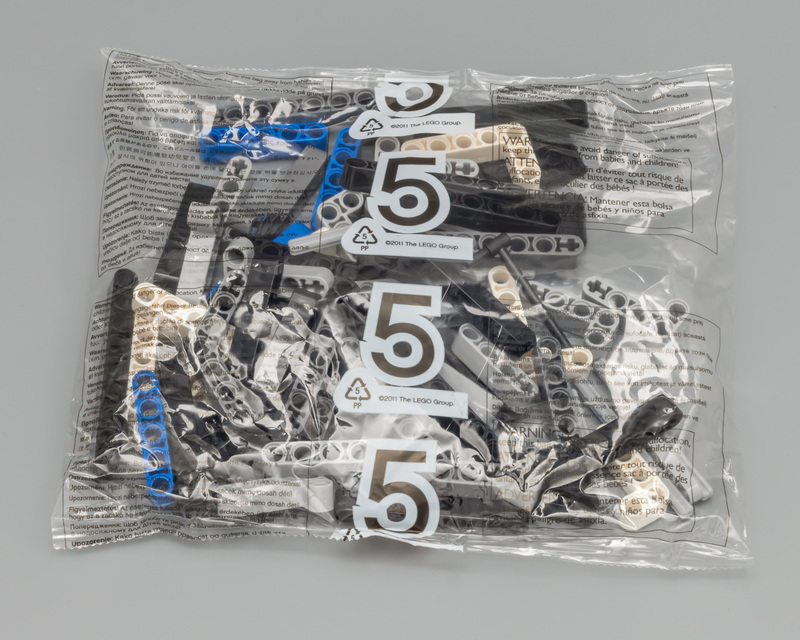 Being the biggest Technic set to date, means lots of parts. 2793 to be precise. 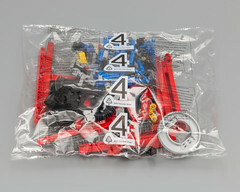 Like the 42039 - 24 Hours Race Car (some of them) this set has a square bound book sealed in a bag together with the sticker sheet. I really do like a single bound book, but when TLG divides the build into 6 stages, providing 6 booklets also makes sense. 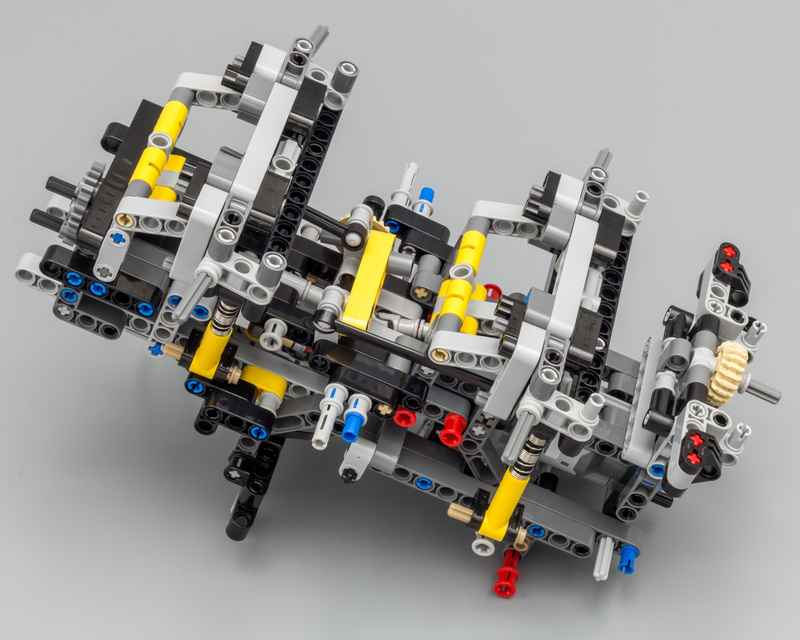 This would make building with your children a great deal easier. 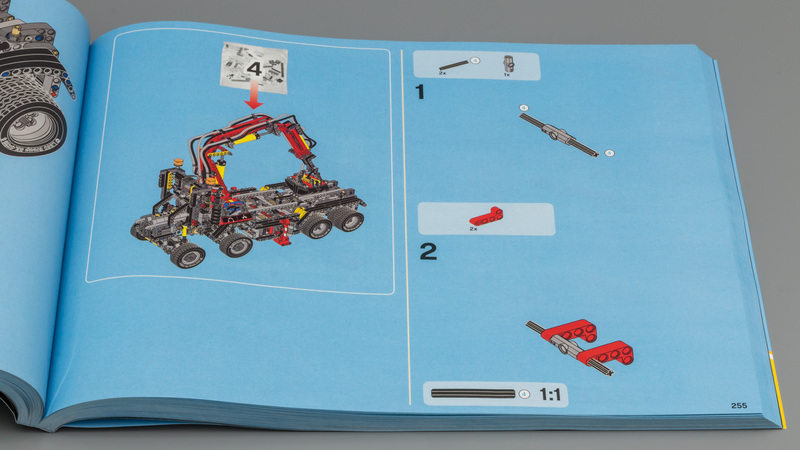 The instructions for the A-model count 105 steps, covering a whopping 471 pages! 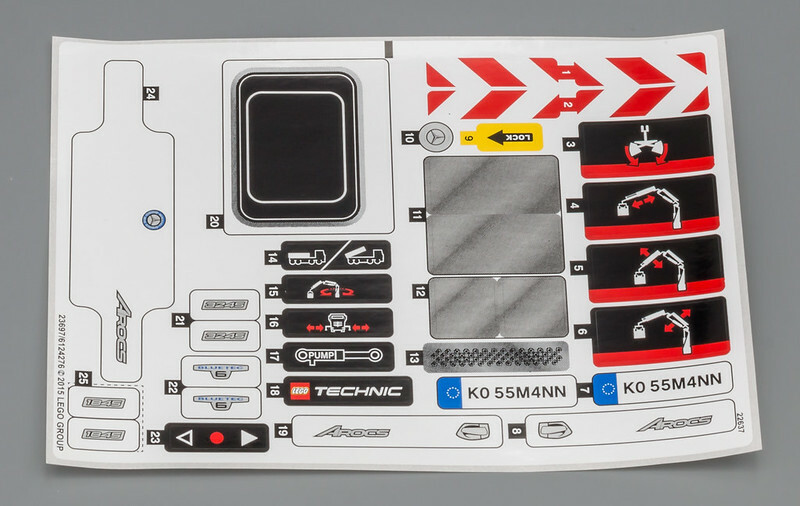 The sticker sheet with stickers for the A-model and two stickers (#25) for the B-model, apparently a Mercedes-Benz Actros 1845. 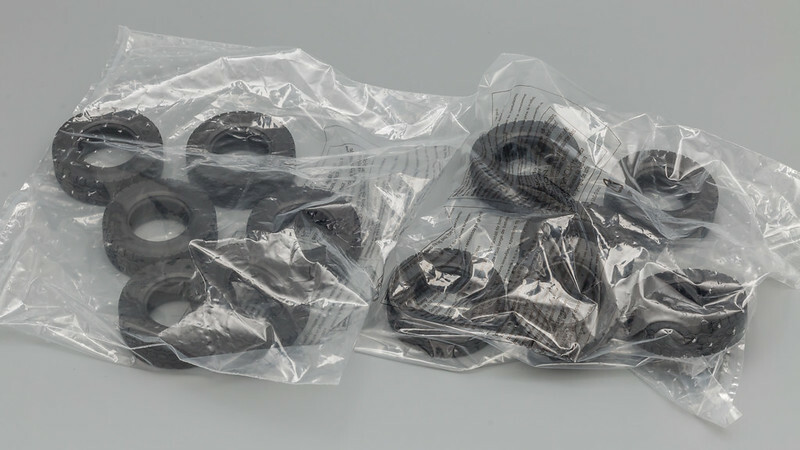 For the first time (to my recollection) the 62.4mm D. x 20mm Tires are packed in bags. 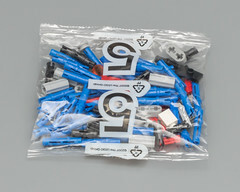 Normally they are scattered between the sealed bags. 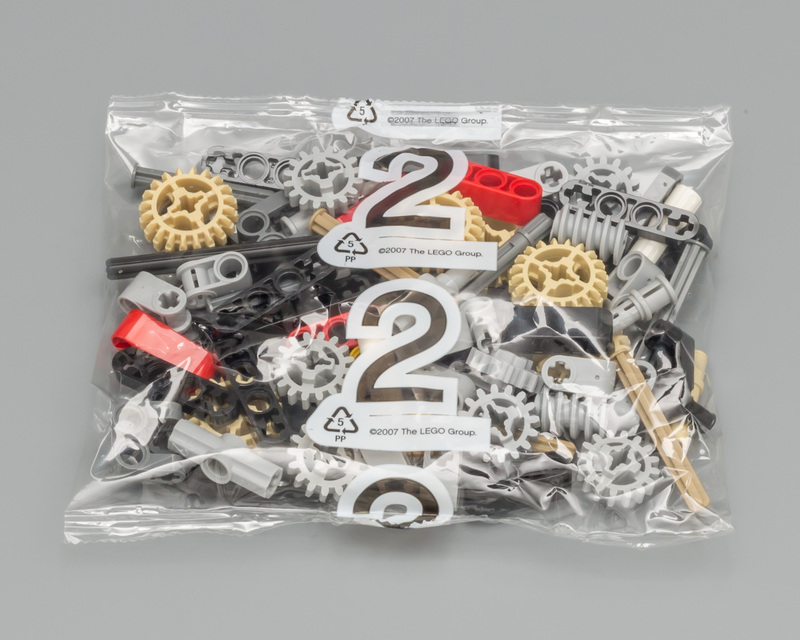 The new Pneumatic (V2) parts have been neatly packed together in a single bag. 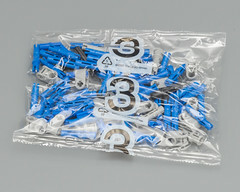 The hoses are cut to length, which makes assembly more straightforward. There's no need to measure and cut the hoses yourself. 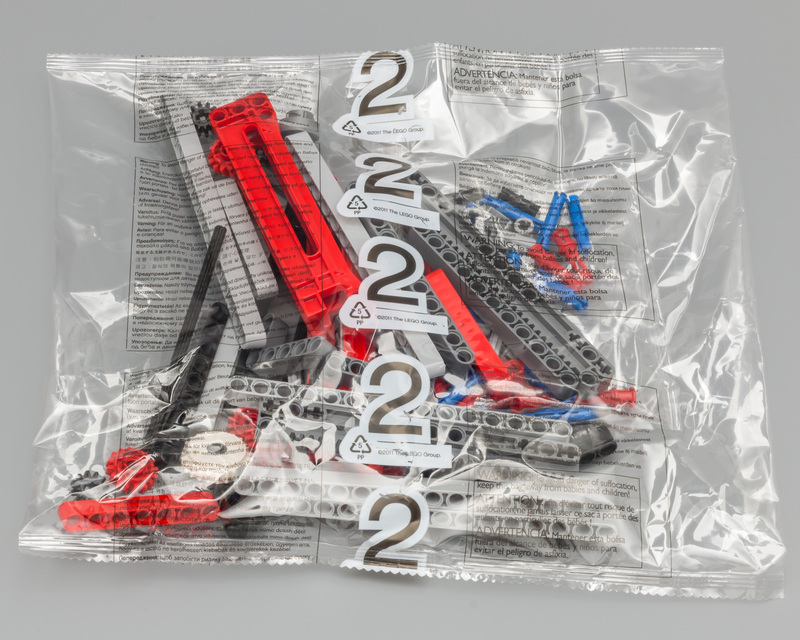 The L-motor comes in a bag, while the battery box doesn't. 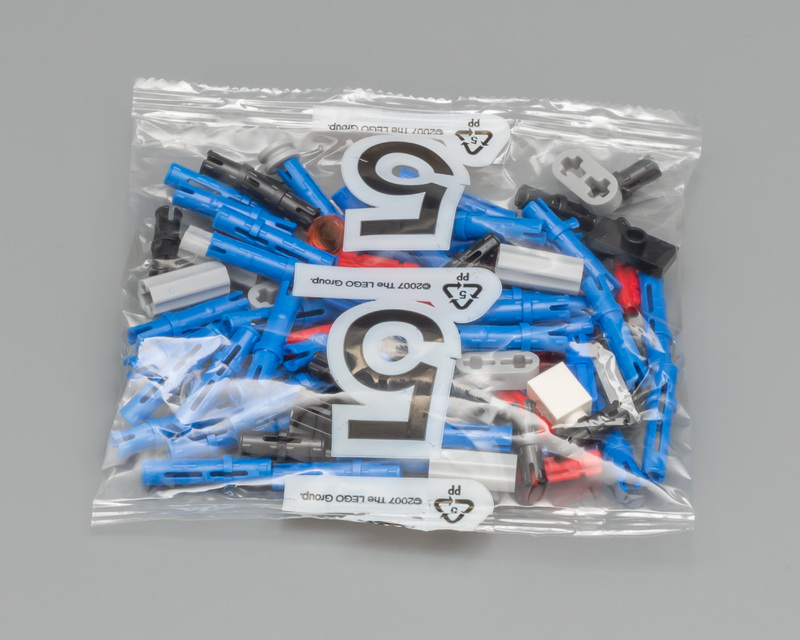 Normally the battery comes in a bag too. Since it has a slightly different color than the previous version, maybe the manufacturer or manufacturing process has changed. 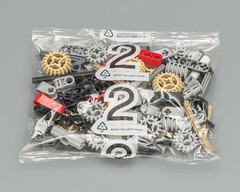 A total of 21 numbered bag, divided over 6 build stages. You can click on the bag to show a hi-res version of the picture. 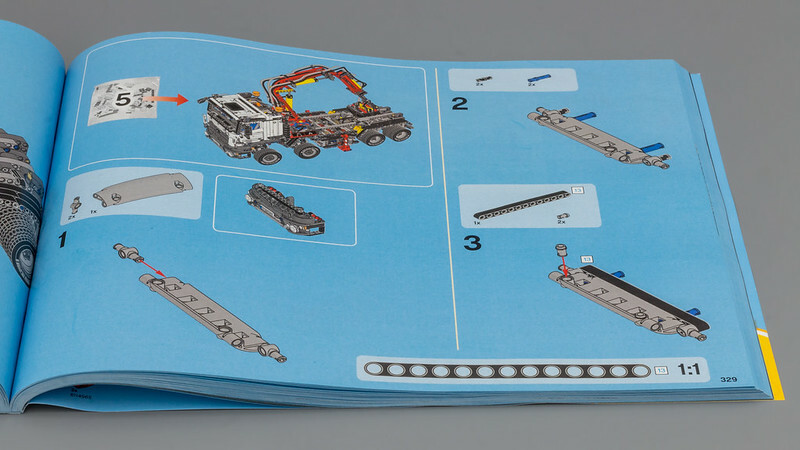 This chapter describes the interesting and/or new parts in this set. The color of the new battery box is slightly different than the old one. The dark bluish grey is much darker and the light bluish grey seems to be slightly different too. For the first time a set comes with very small white panels (#21) and very small white panels (#22). 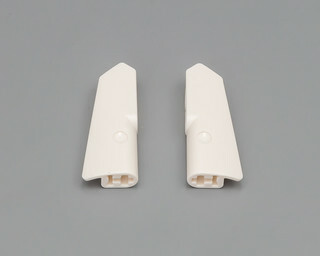 These two panels complete the range of white panels available. Four other types or white panels are used in the cabin. That kinda looks like a new turntable under the crane. 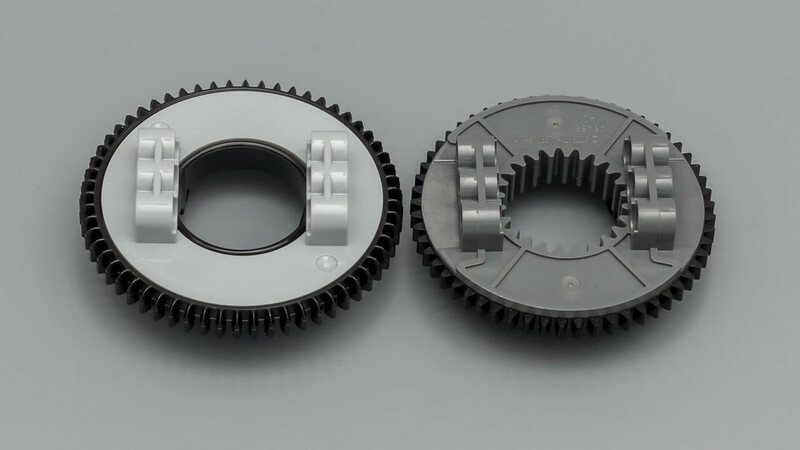 Allanp was absolutely right about the introduction of a new 60 teeth turntable, resembling its smaller brother (bottom and top). As you can see in the comparison shot below, it's not much bigger than the old version. The design is much better, resulting in a smoother operation. The potential downside is that the new turntable doesn't have teeth in the inside, which can be limiting. That being said; I still think that this design is better than the old one, so thanks to TLG for bringing us this new turntable! Hopefully TLG will some day release an XL version with this design. 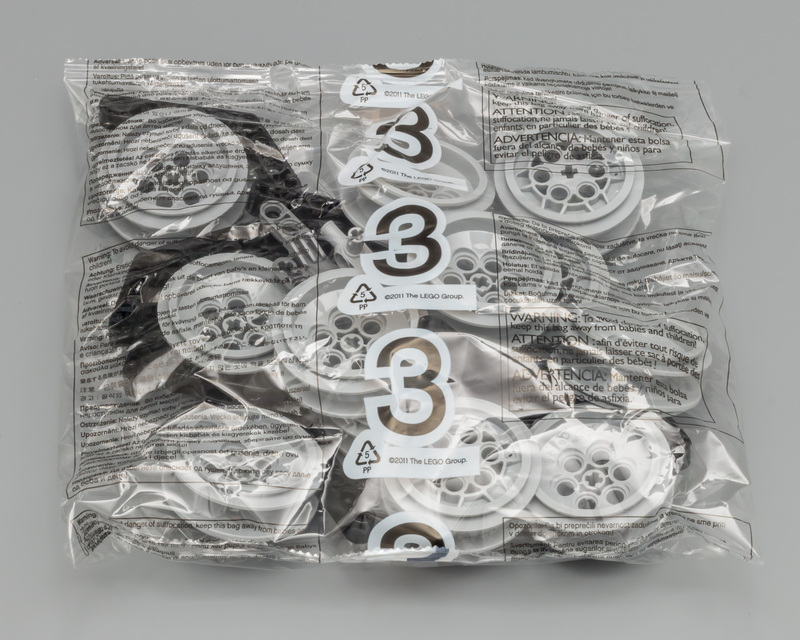 Nothing special about these tires, besides coming in a sealed bag. So, why am I showing these tires anyway? It has nothing to do with the tires itself, but with the quantity. 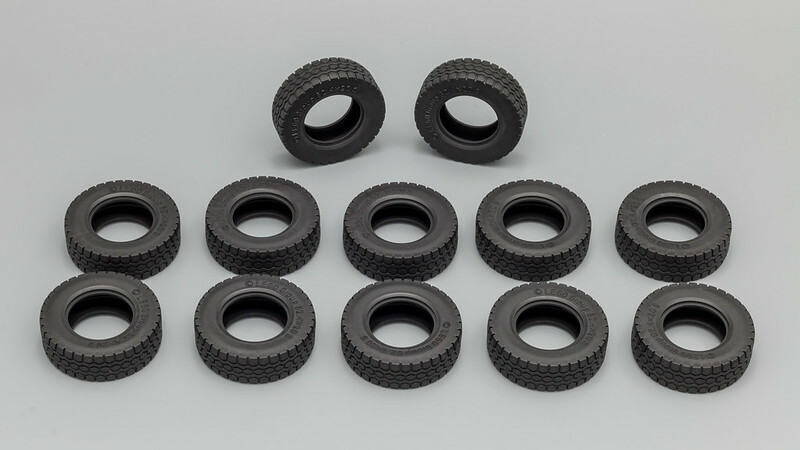 For the first time an official LEGO set contains more than 10 of these tires. The 42009 - Mobile Crane Mk II counts 10 of them and the same goes for the 8285 - Tow Truck from 2006. The latter also had double wheels on both rear axles, but it only had two front wheels. 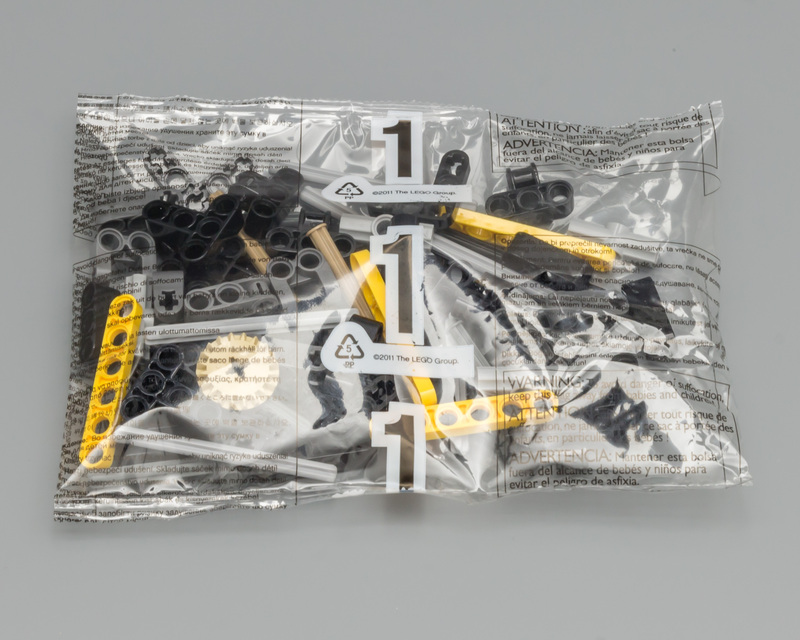 I'm not sure what the part names will be, but crane arm outside and crane arm center are used for similar parts in the City theme. 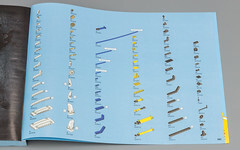 I will stick to Liftarm Bracket and Gearrack. 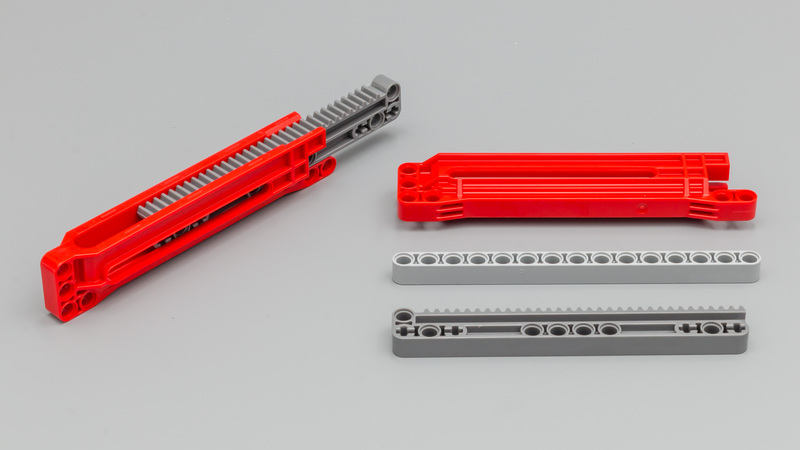 These two new parts are perfect for outriggers and crane sections, but I am eager to see what MOC-ers come up with. 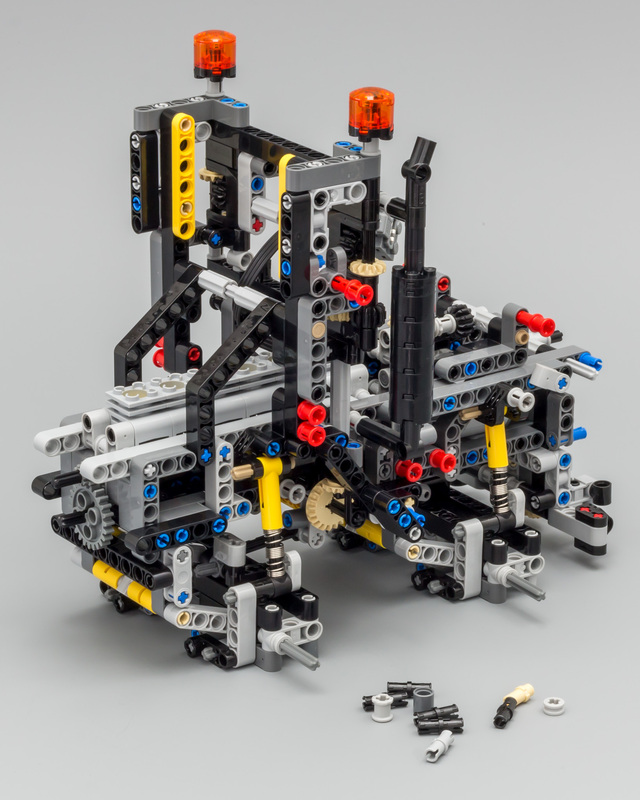 I do see an application for Mindstorms Robots or TC7 Contest entries. 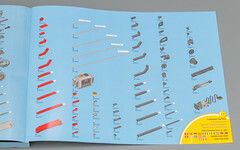 The red section, containing the gear rack, is 15L. The gear rack itself is 14L. 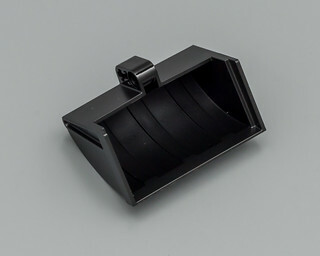 Two clamshell buckets are introduced in this set. After the Grabber Arm Claw, this is welcome addition for crane enthusiasts. 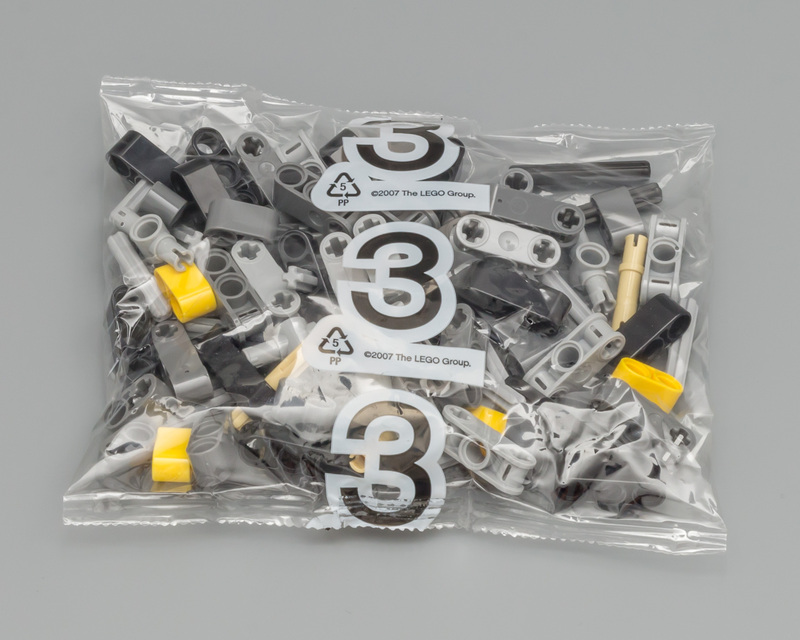 Save the best for last, the new Pneumatic parts! 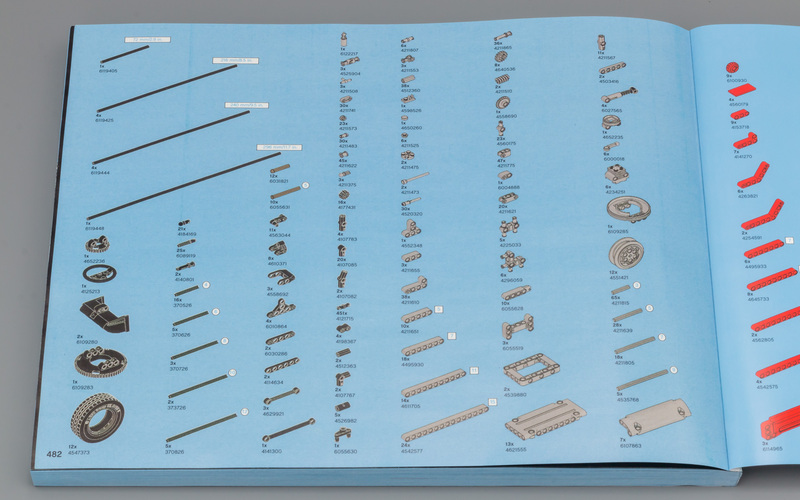 Some people like pneumatics, some people don't. Nonetheless, it's great that TLG hasn't abandoned Pneumatics in favor of Lineair Actuators. 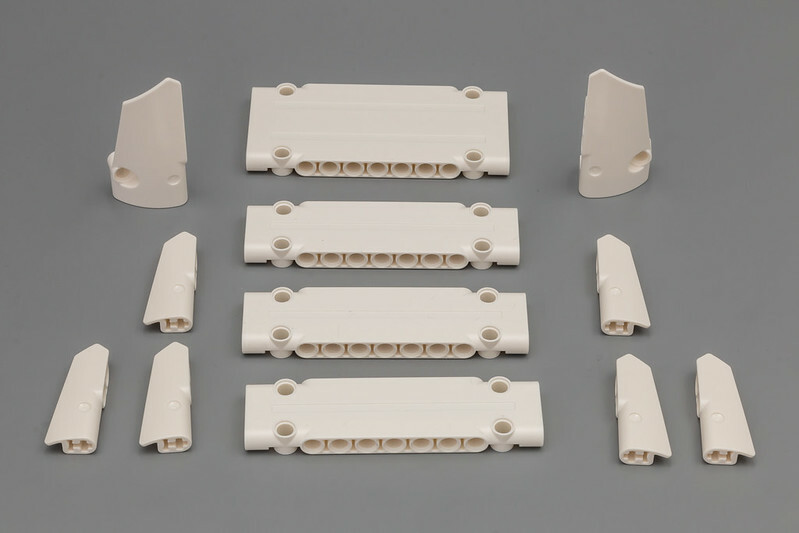 They have redesigned some of the existing parts and even designed brand new ones. 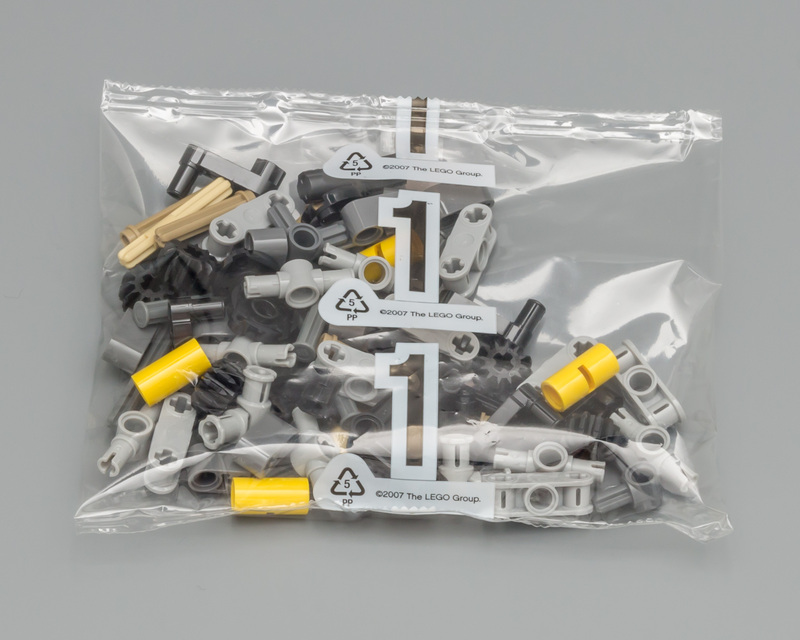 Some people on this forum will be so thrilled with these new parts. The outlets of every element have been redesigned in a way that the hose will be easier to attach. 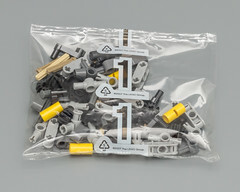 This means the existing elements do have new moulds too. Like the small cylinder, the Small Pneumatic Pump 6L has also been redesigned. 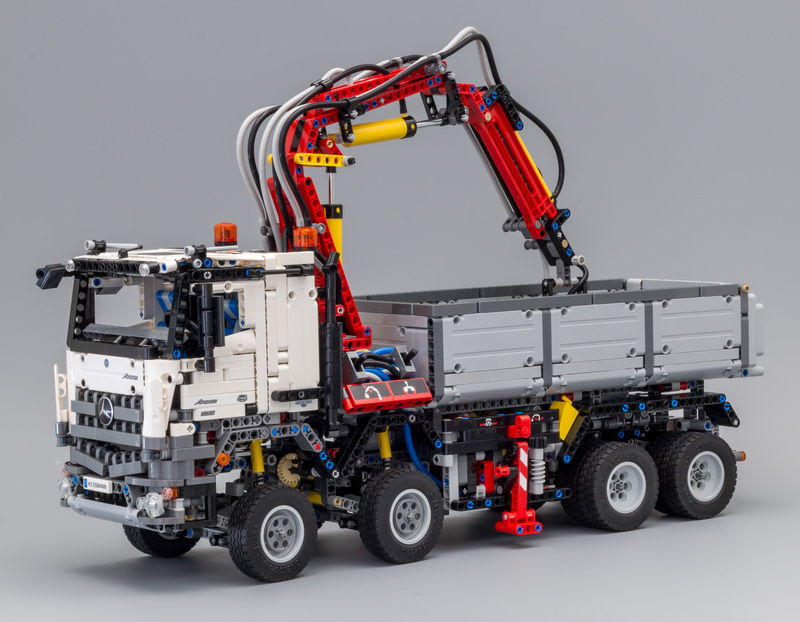 And TLG has used blue again, instead of the Unimog pump, where they used grey. I do like the blue version better, although you will probably not clearly see the pump in the finished model. The right pictures shows the three different versions of the pump. 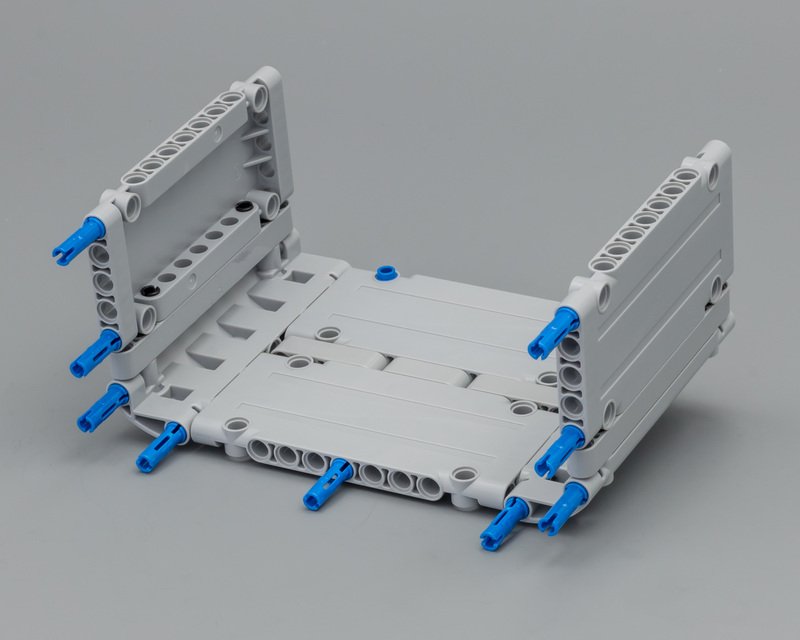 The new 2x2 11L Cylinder is 4 studs longer than the old Pneumatic Cylinder. 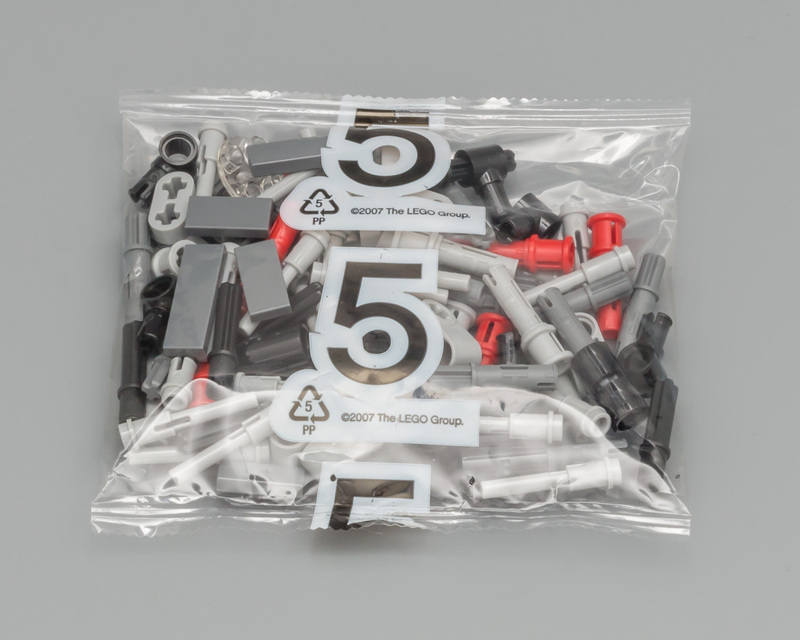 I wonder if TLG will release a new version for the 7L cylinder as well. The picture on the right shows the 7L (right) and new 11L cylinder (left). 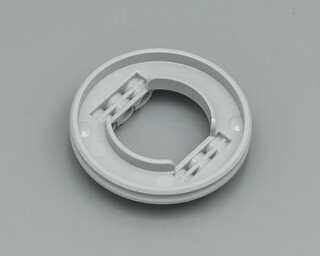 When you do need length, but not a lot of power this new 1x1 11L will perfectly fit your needs. The new version of the switch is simply a redesign of the old Pneumatic Switch with modified outlets. The pictures on right shows the comparison. 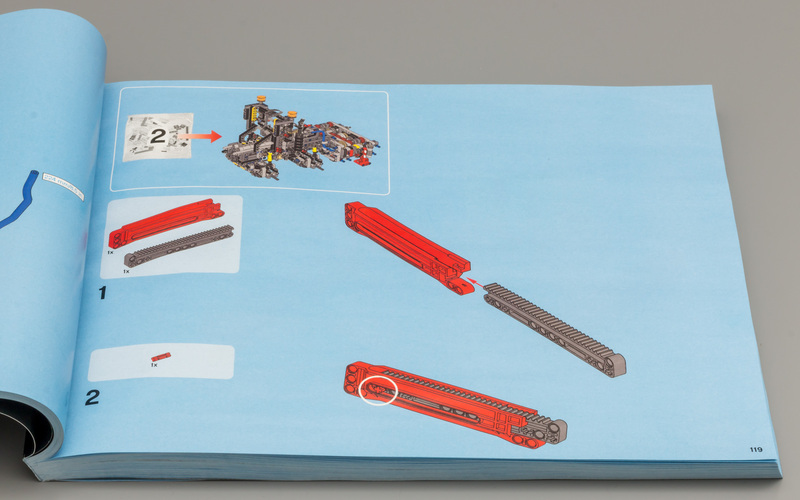 The part list, spreading over 3 pages, counting 2793 parts. 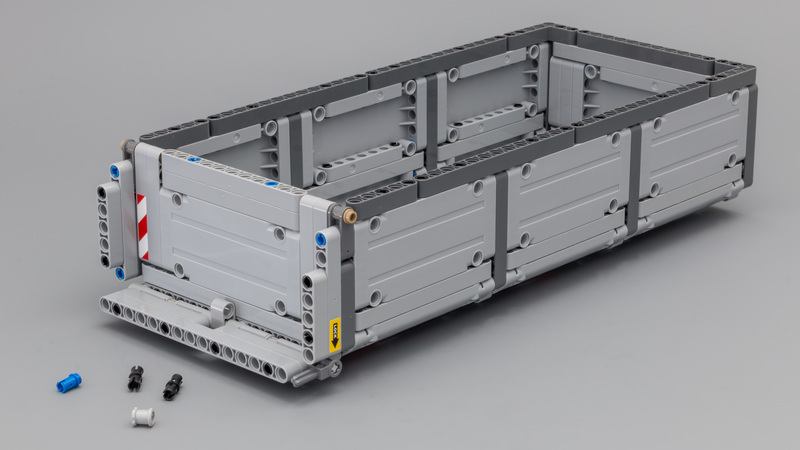 You start by building the front section of the chassis, with a small part of the cabin. 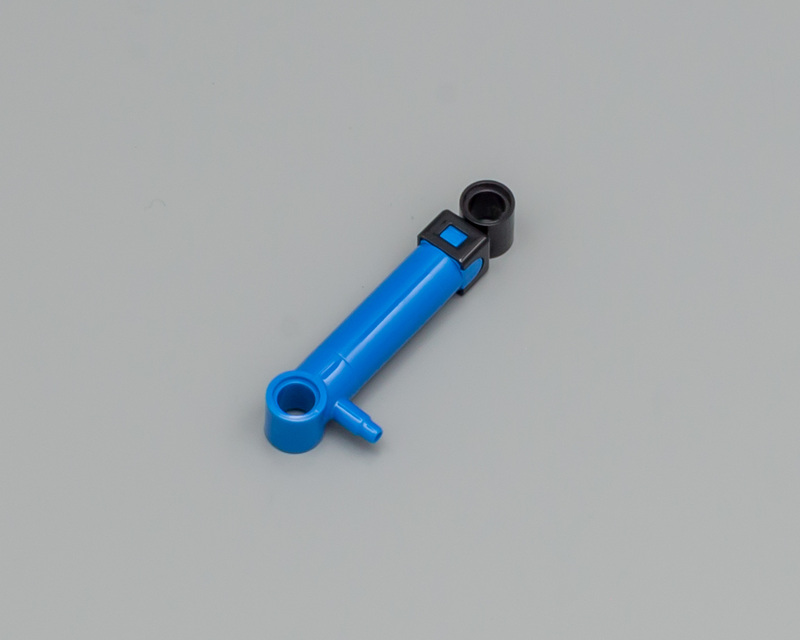 No new parts are introduced in this stage, except for some newish parts from 1H 2015 and 2014, like Pin and Pin Hole and 3L Axle Pin with 1L Axle. 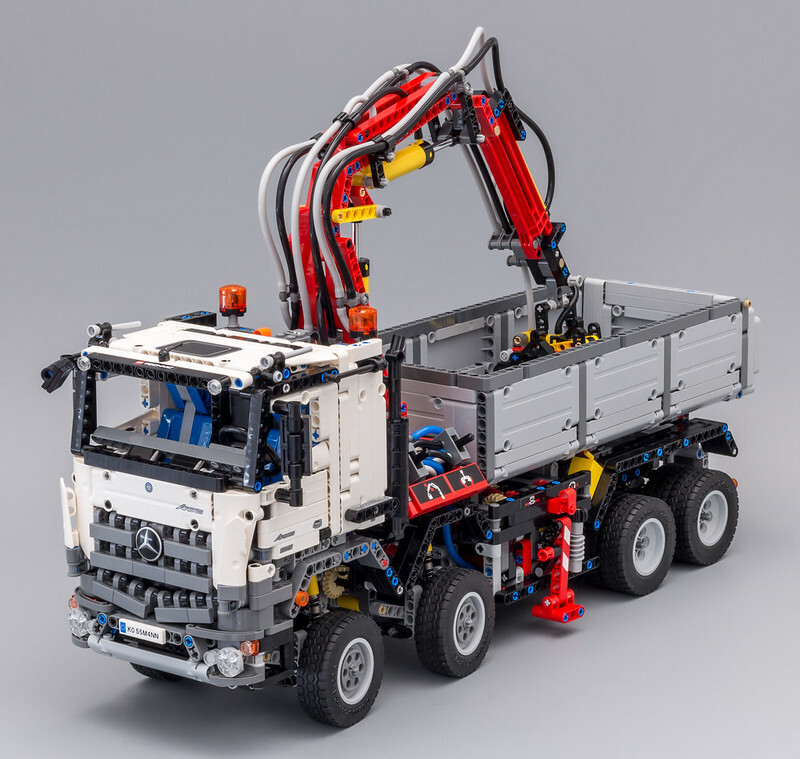 The Arocs has a 6 cylinders inline fake engine. Of course the piston will move when you drive the vehicle. 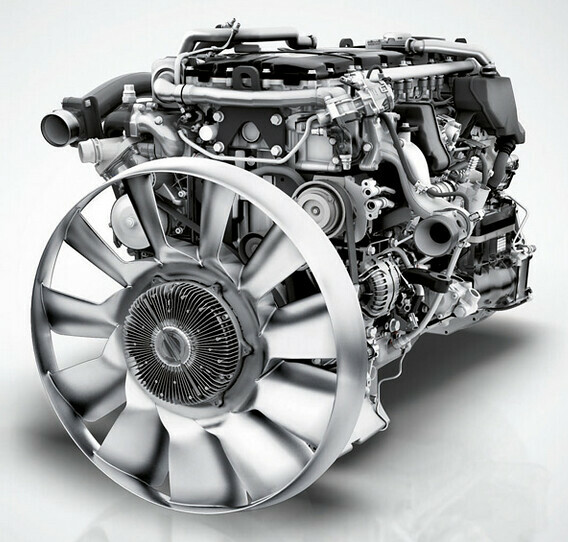 Here's a picture of the actual engine, used in the new Arocs. New 6-cylinder in-line engines with a particularly robust design and a longer life. An 88003 - PF L Motor is placed behing the fake engine, facing backwards. This motor is connected to a gearbox, which we will build in the next stage. 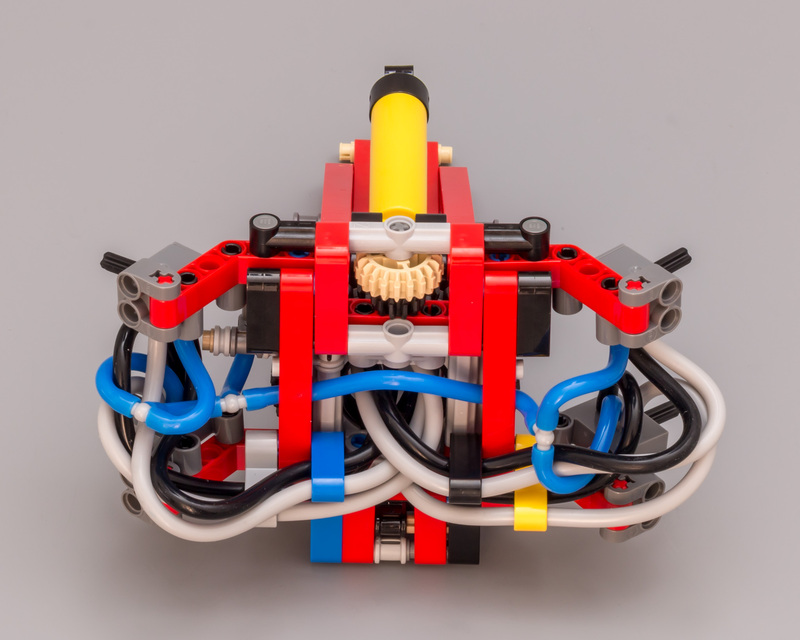 This single motor will power all the motorized functions. 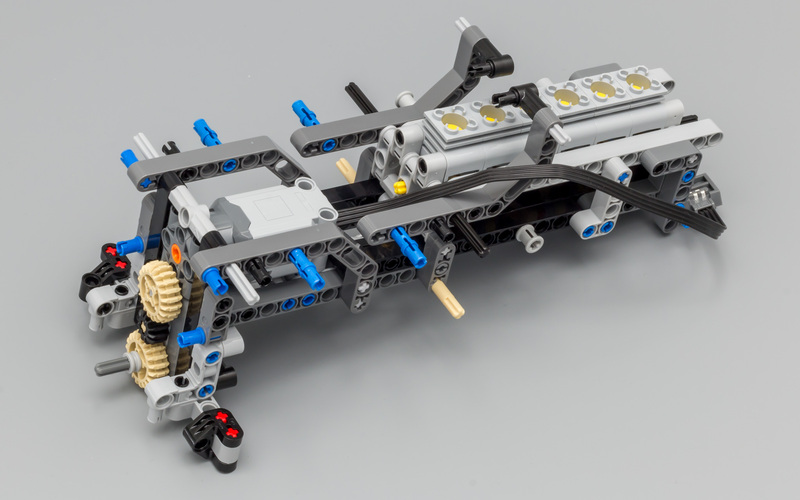 Below you see the first front axle, with suspension. 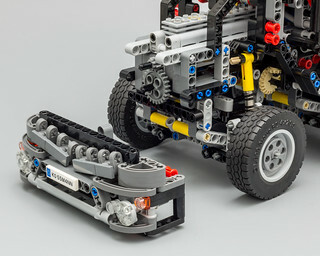 The 9L Technic Link is used to steer the front wheels. 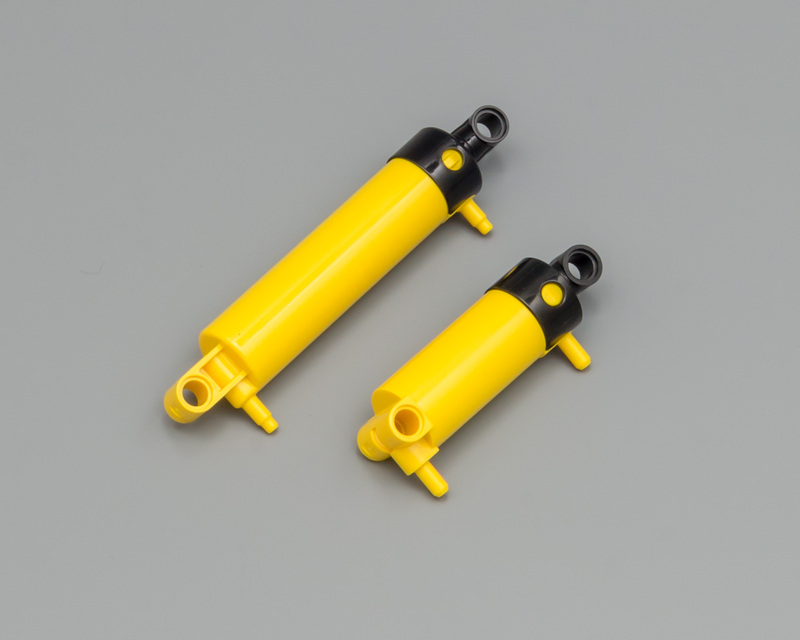 The front suspension uses the yellow Hard Spring Shock Absorbers, resulting in pretty stiff suspension. 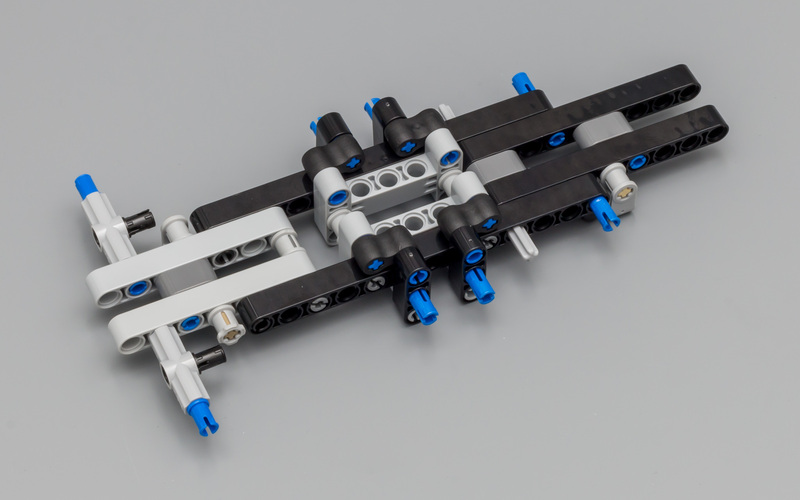 When the assembly is connected to the chassis, the 9L Technic Link is connected to a pivot point. Rotating the pivot point will move the link back and forth causing the front wheels to steer. 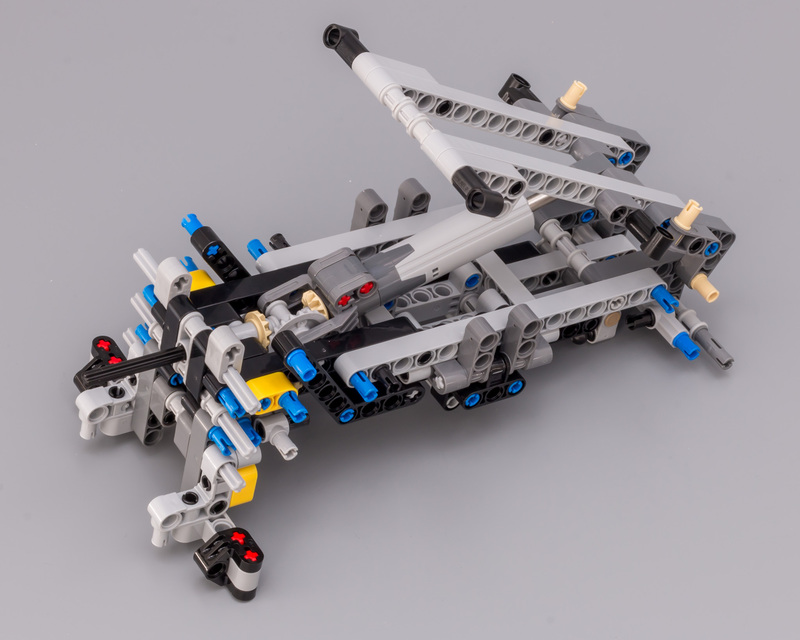 The second axle is connected to the chassis. 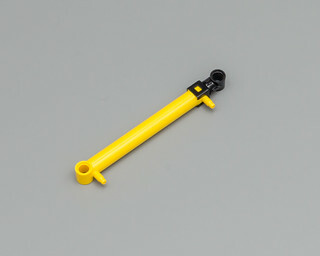 This axle uses a 6L Technic Link for steering. 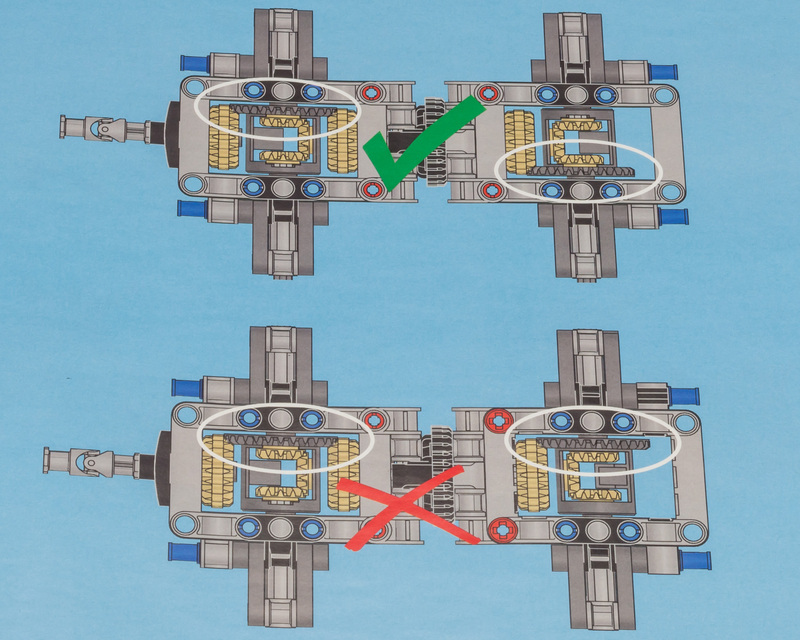 Using different links results in different steering angles for both axles. 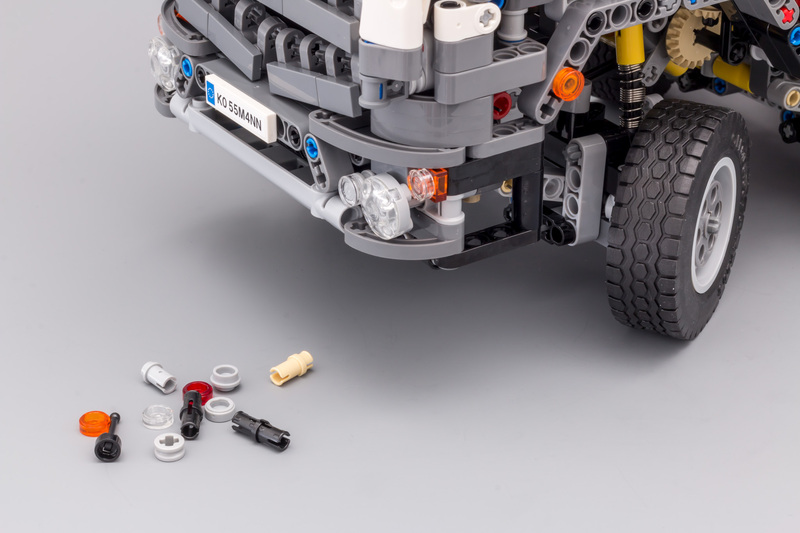 I did notice a strange anomaly; the front axle does have 1L Round Pin Connectors, while the second axle doesn't. 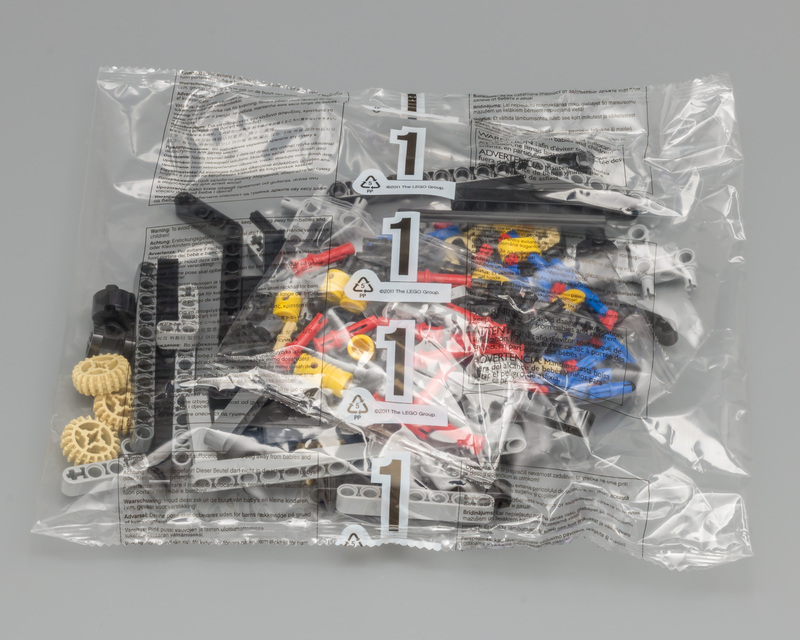 The leftover parts only show one extra?! The video below shows how the steering mechanism works. Make sure the 12 Teeth Bevel Gear on the right is placed properly. 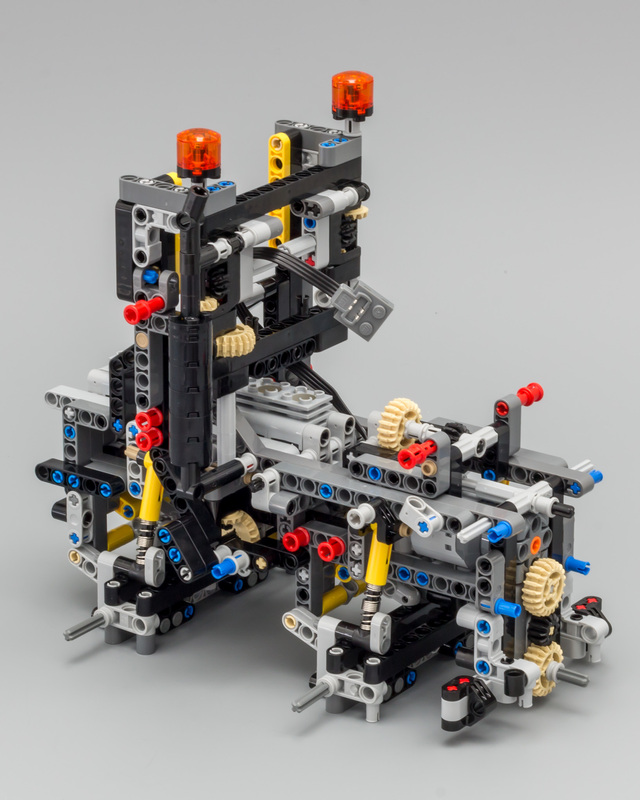 I placed the gear in the same position as the one on the left, resulting in one of the lights making the model steer to the left side when turned right, and vice versa. The two pictures below show the model after stage 1. The build is okay so far. 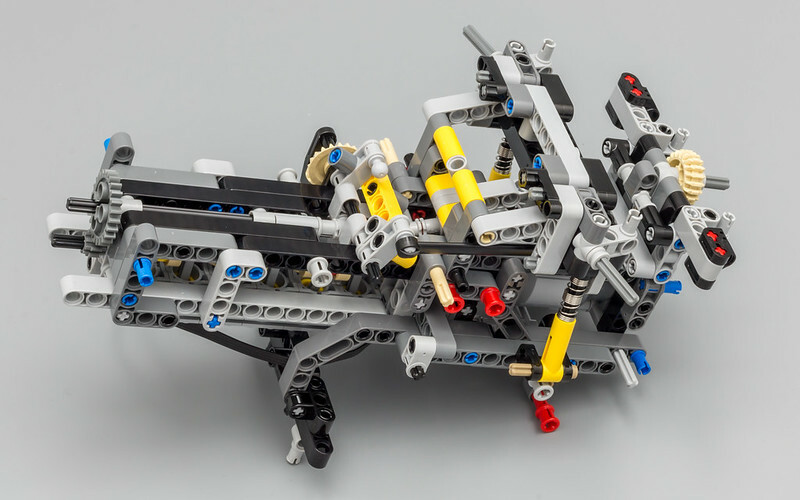 The most interesting thing about this stage is obviously the steering mechanism, attached to the pendular suspension. 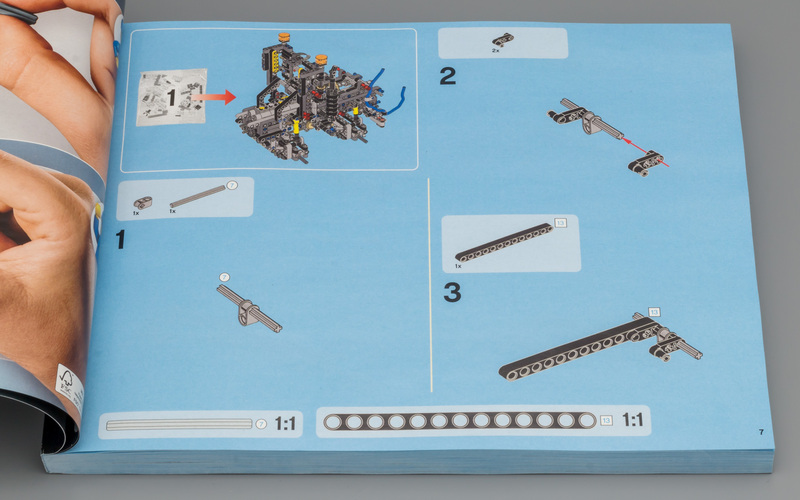 The mechanism is unlike steering mechanisms found in other models, so this required some out of the box thinking. The first step of the second stage starts with the new bracket and gear rack. 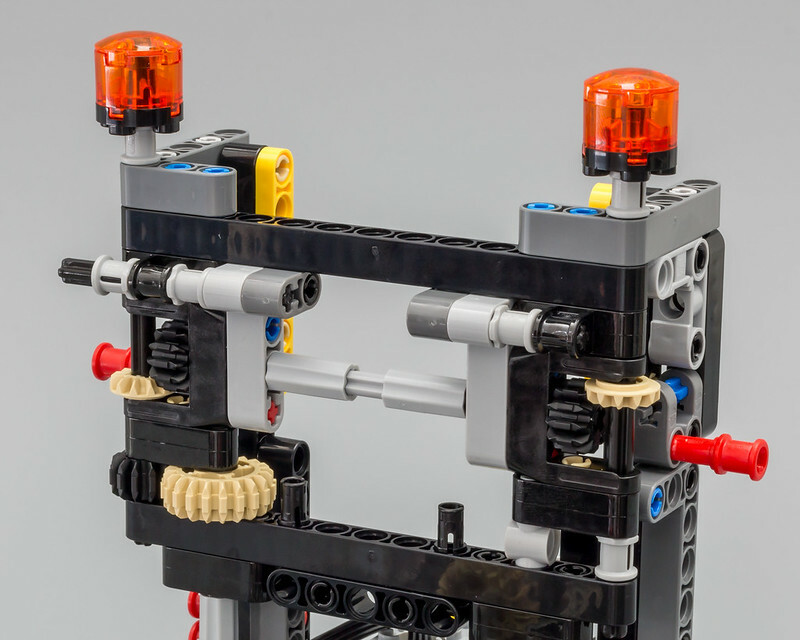 The outriggers could easily have been designed without this new gear rack, but since TLG designed it for the crane (probably); why not use it here. The stabilizers on the outriggers are operated manually. 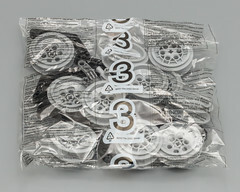 It would have been great to have motorized pads too, but it's not a big deal. 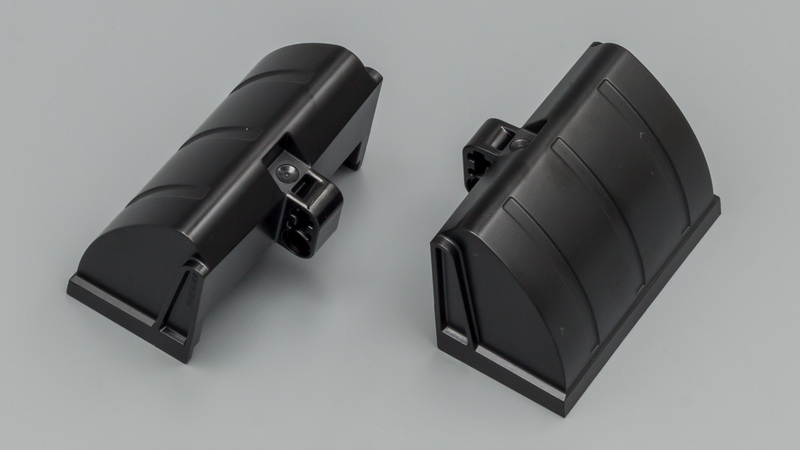 The two outriggers are linked together in opposite directions. 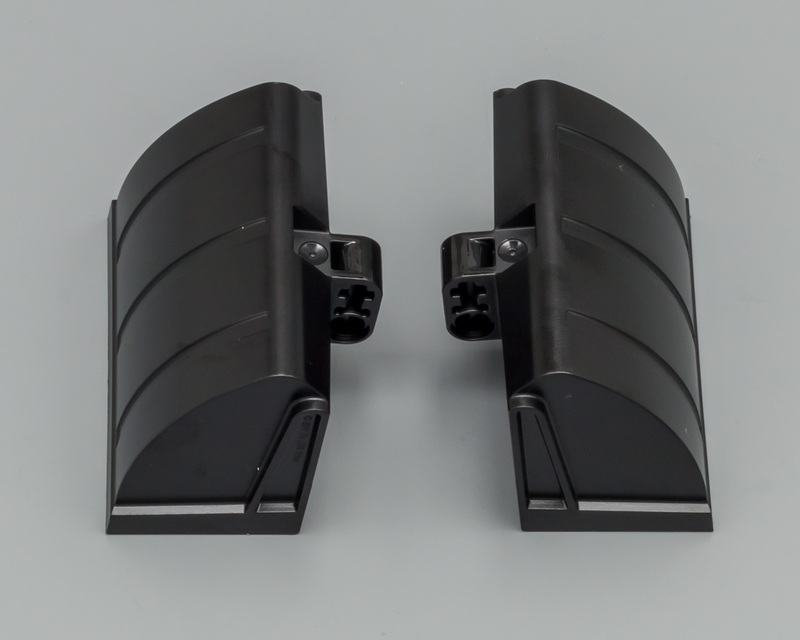 The new parts provide a compact solution, but there are no fixed mounting points for the driving gears. 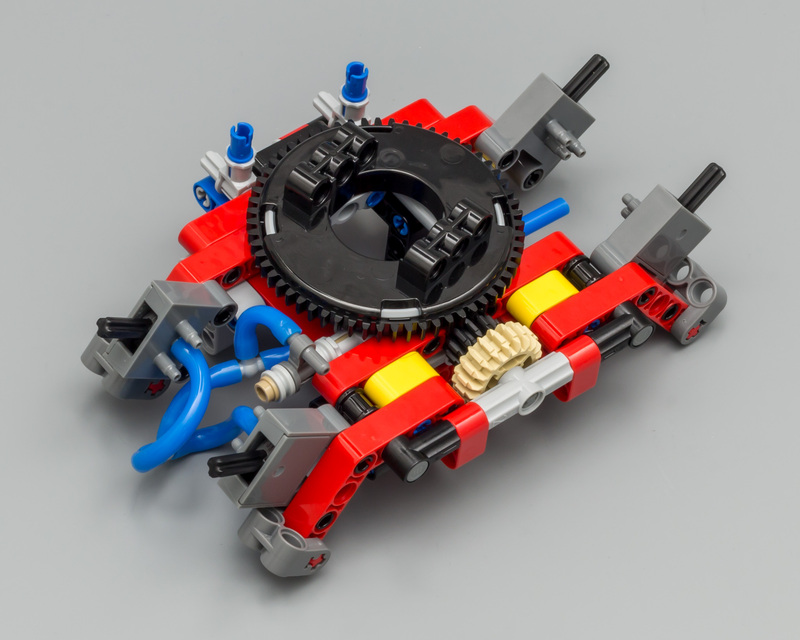 The gearbox consists of two layers with gears. The lower part of the gear box contains the Pneumatic Pump, much like the one found in the Unimog. 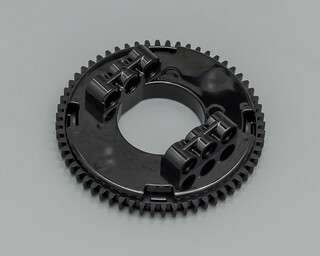 Two black 12T Bevel Gears are driving the gear racks. 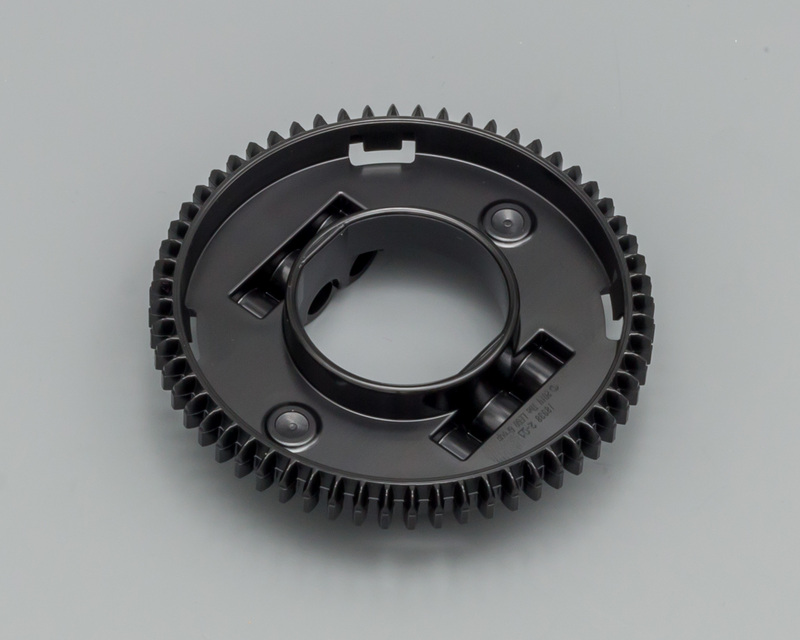 The upper layer of the gear box contains the white Clutch Gear. 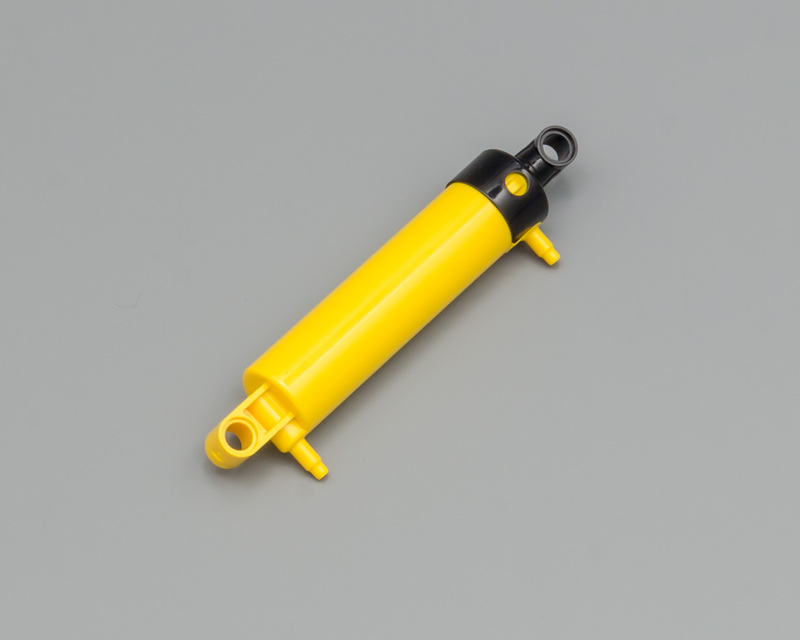 This gear prevents the motor from stalling and overheating when the end of a function has been reached. 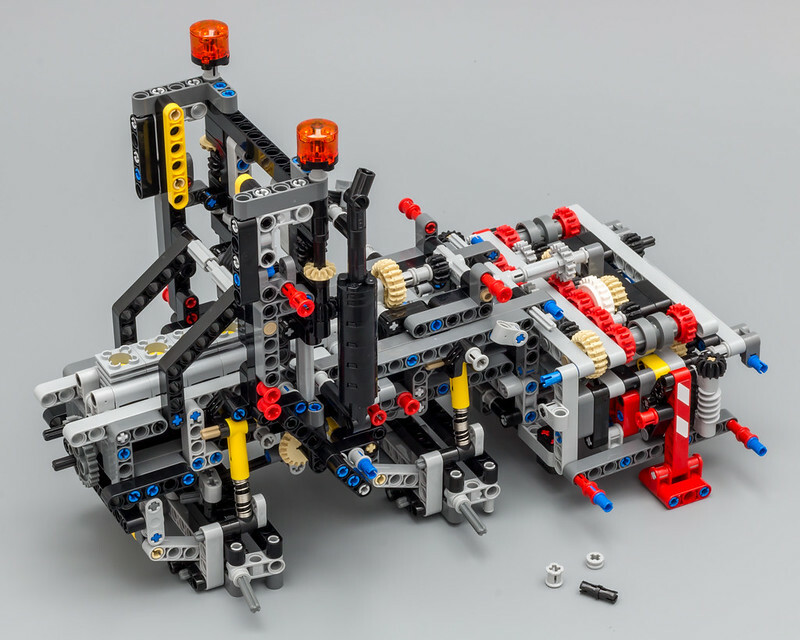 At the end of stage 2 the gearbox and outriggers are connected to the front-end of the chassis. The truck is slowly taking shape. At this stage I was still not 100% convinced what I would think of the complete model. With 135 minutes, the second longest stage in the build. 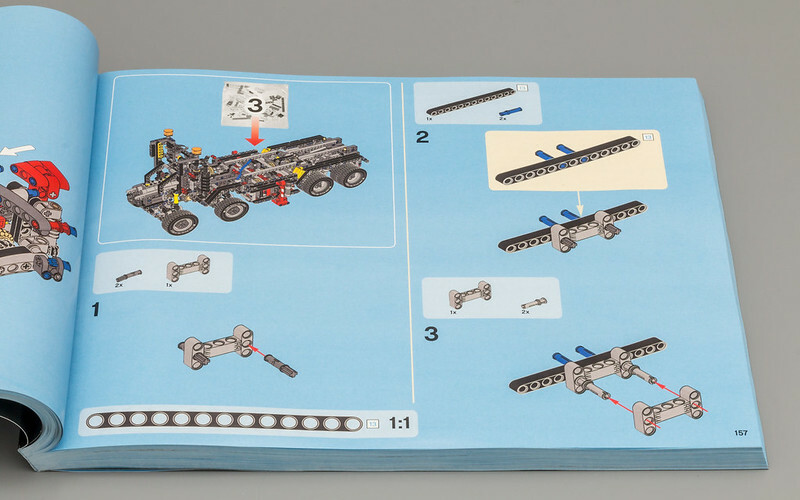 In this stage you will build the rear-end of the chassis, with suspension and drive train. 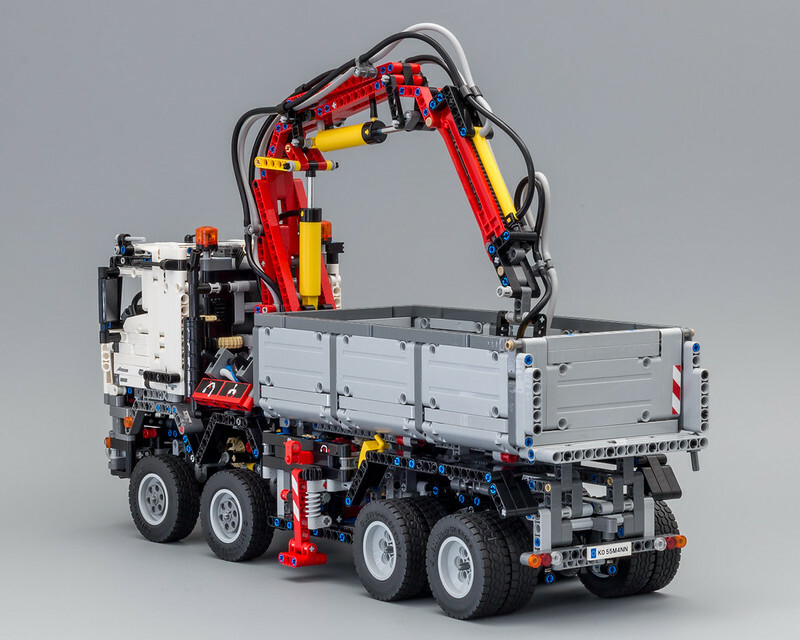 Four Flexible Rubber Axles are used in the base of the chassis. 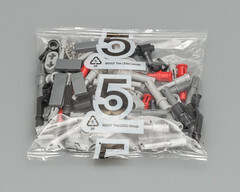 I am not entirely sure why TLG used these parts, since you will lock the assembly using liftarms. 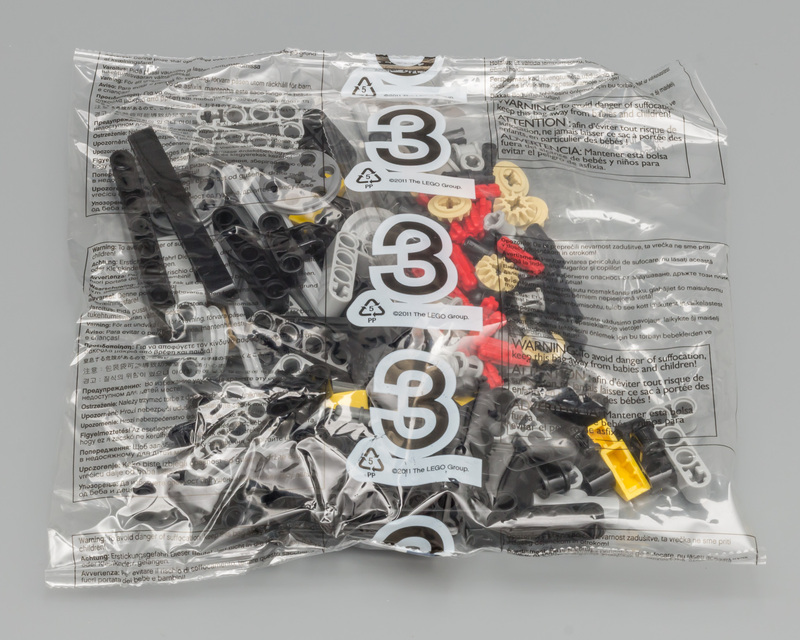 Possibly, it's a construction used in the real Mercedes, or these parts will be used in the B-model. I would love to hear your thoughts. 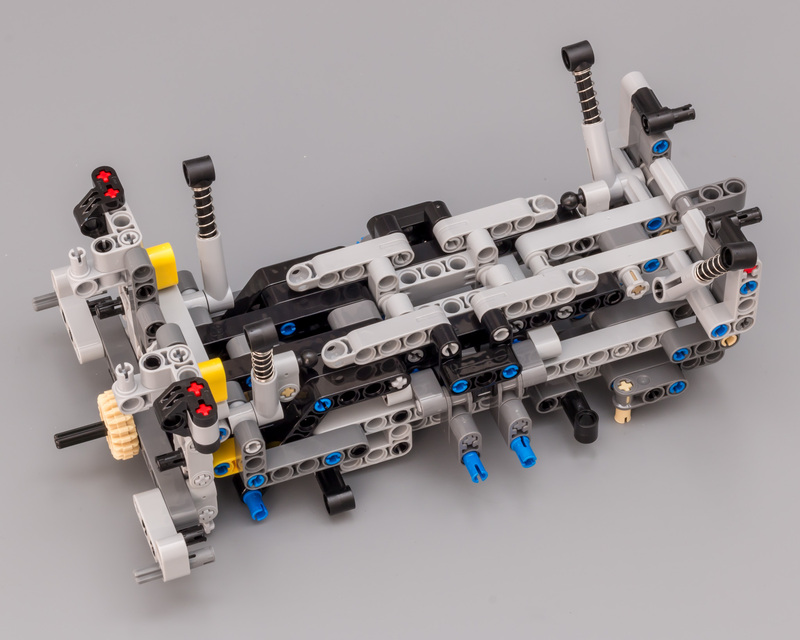 The tilting mechanism for the bed uses a Linear Actuator, instead of Pneumatics. I have made a mistake by placing two of the Pin Connectors in a wrong angle. 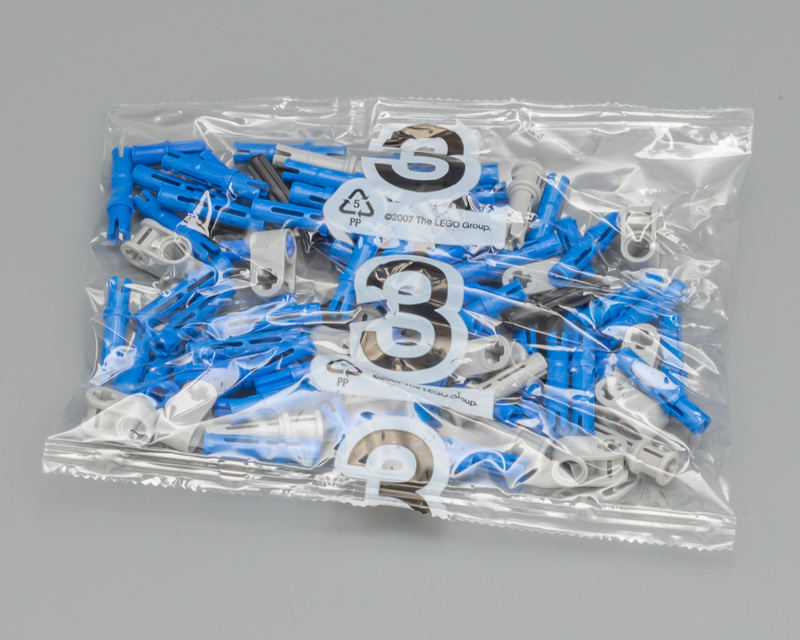 Won't be the last error with these connectors. 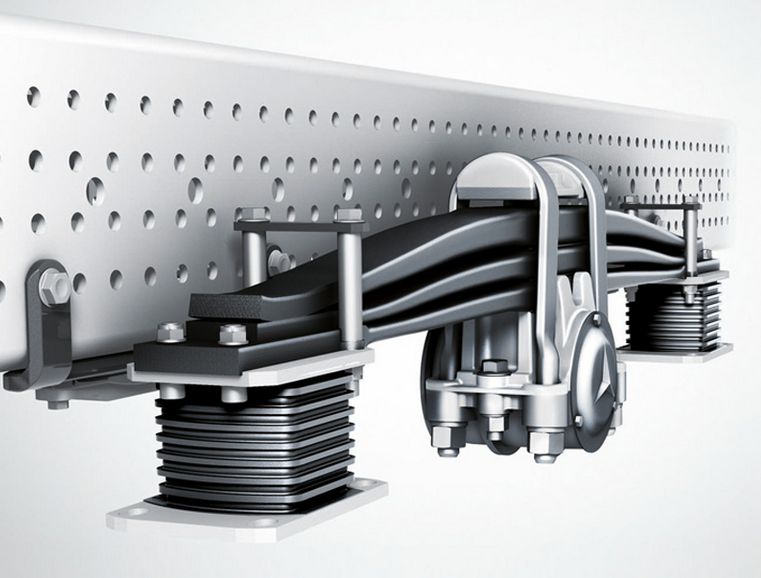 The Rear suspension on the real Mercedes is actually a leaf spring suspension. 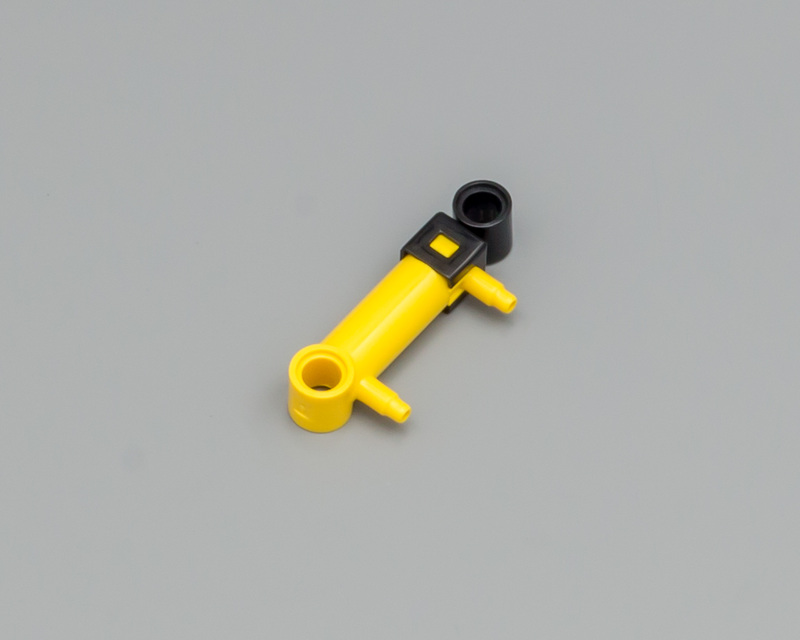 TLG is mimicking this suspension type, by using the relatively new Steering Arms found in the 42021 - Snow Mobile and 75060 - Slave 1. 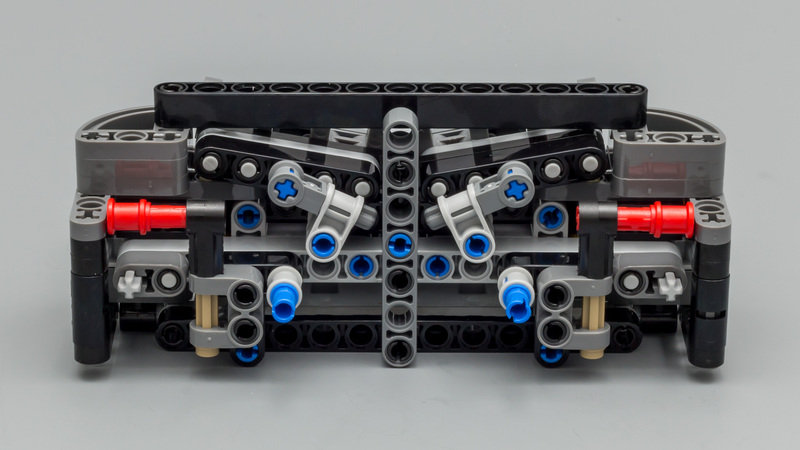 Picture of the real rear suspension. 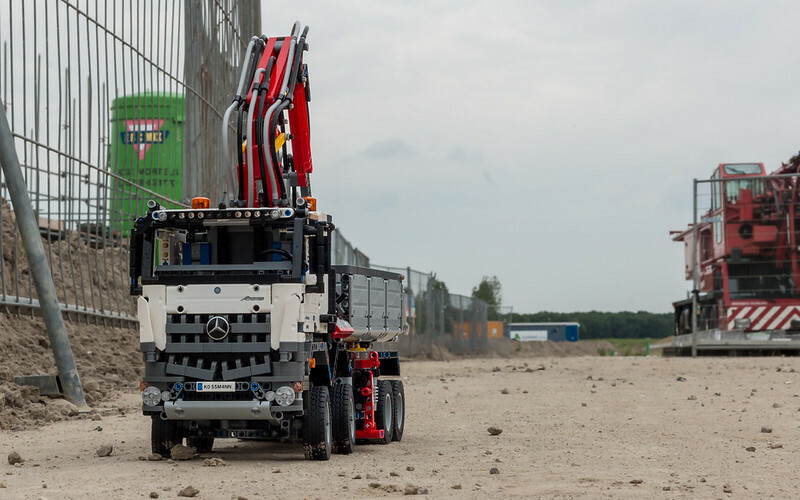 The steel suspension on the Arocs impresses in every situation with its robust, solid construction, high performance and loadability. 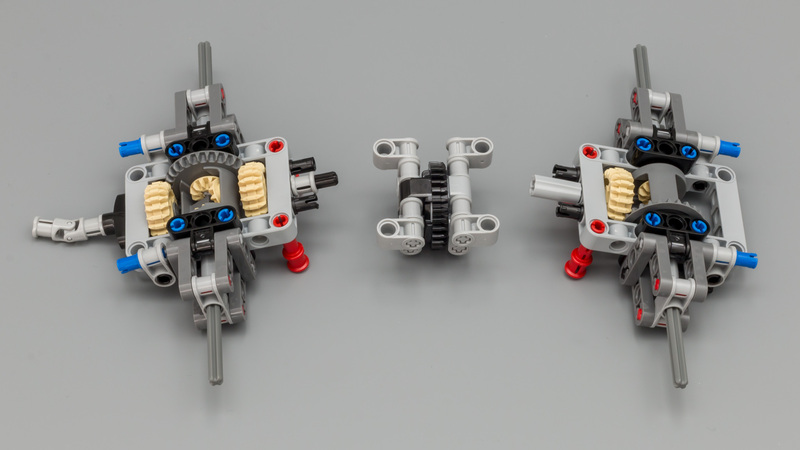 Two differentials are linked together using a small turntable. Although being linked together, the two axles still have the ability to move independently. 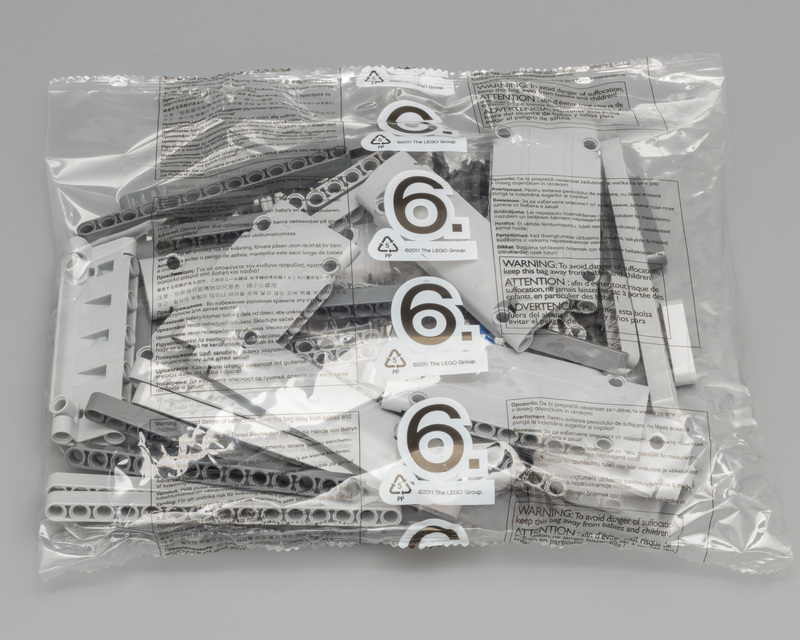 The model will have two live axles, linked together by a drive train through the small turntable. 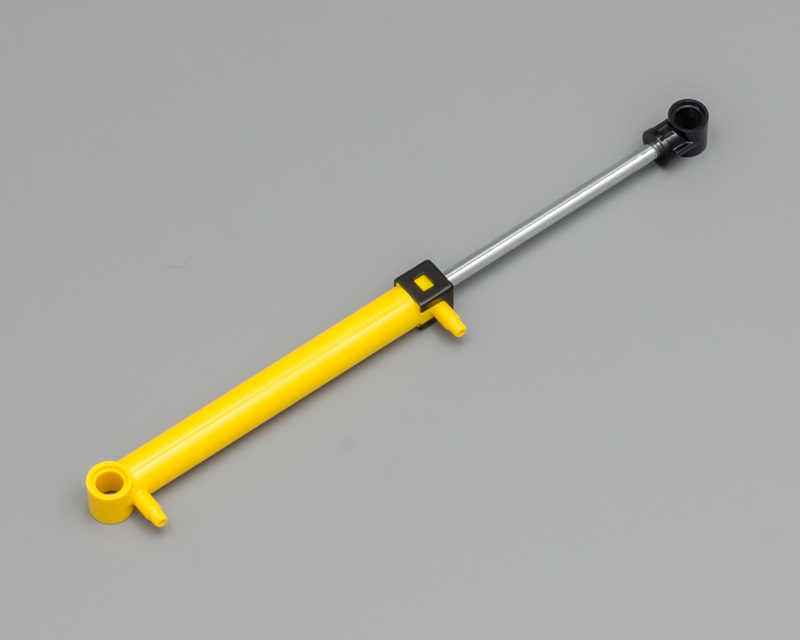 A live axle is a type of beam axle in which the shaft (or shafts, since live axles, while connected to move as a single unit, are seldom one piece) also transmits power to the wheels; a beam axle that does not also transmit power is sometimes called a dead axle. 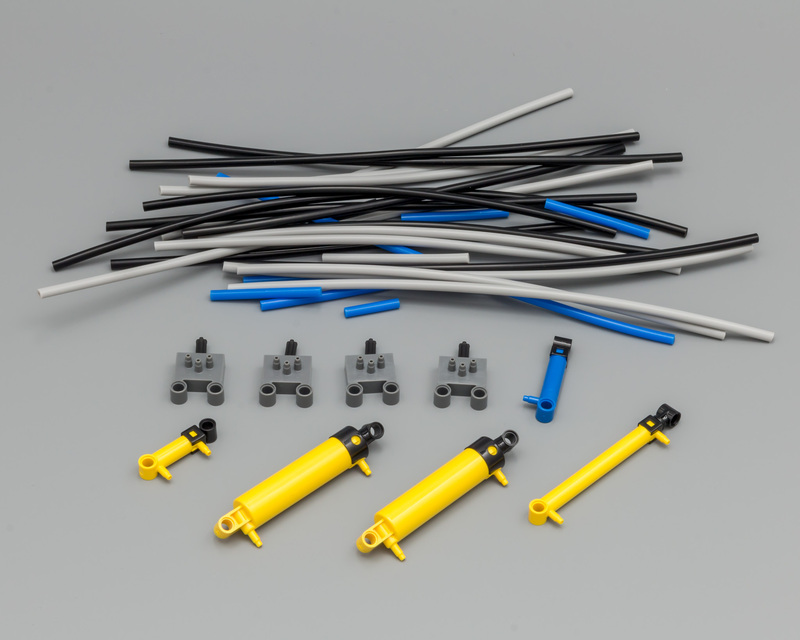 While typically used in vehicles with Hotchkiss drive, this suspension system can also be used with other types of power transmission. 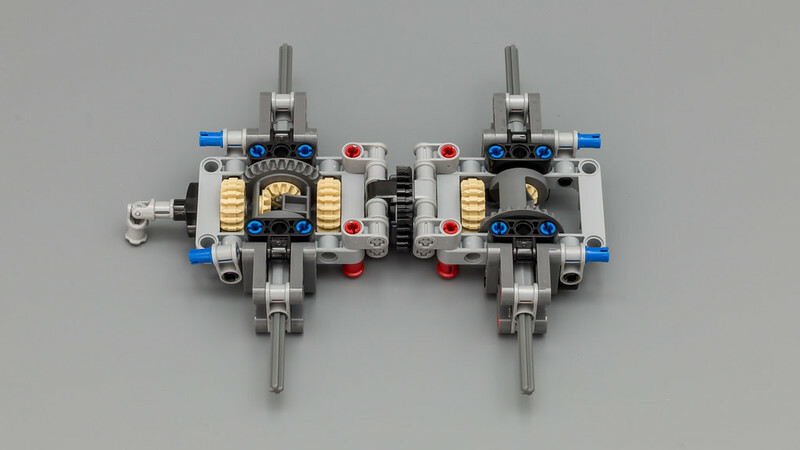 The rear axles are a single unit (suspended by 4 springs) that pivots longitudinally to allow the two axles to twist independently from each other by means of a 28t turntable piece allowing full suspension and both rear axles to be connected to the engine whilst all fitting between the dual rear wheels. Simples! 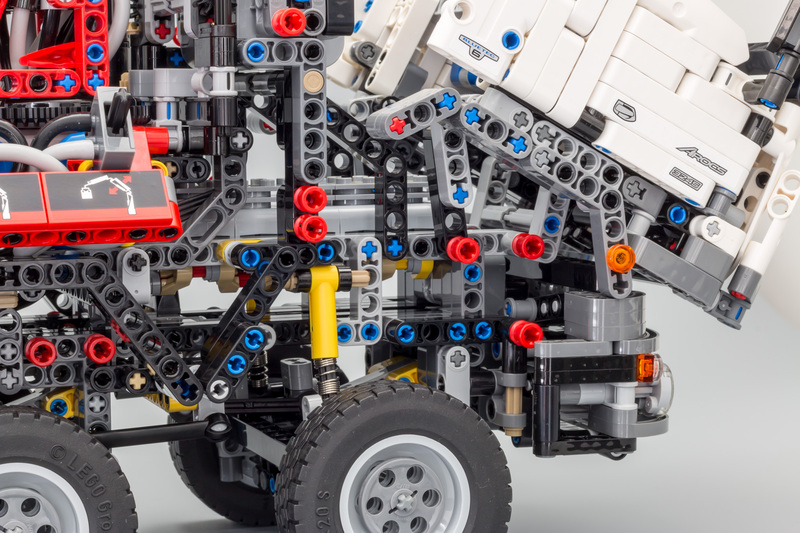 Here's a video showing the rear suspension and drive train. We've all been there, a model with two differentials and one of them is turning the wrong way. TLG has published an explicit warning in the building instructions. Pay attention to the position of the differentials! 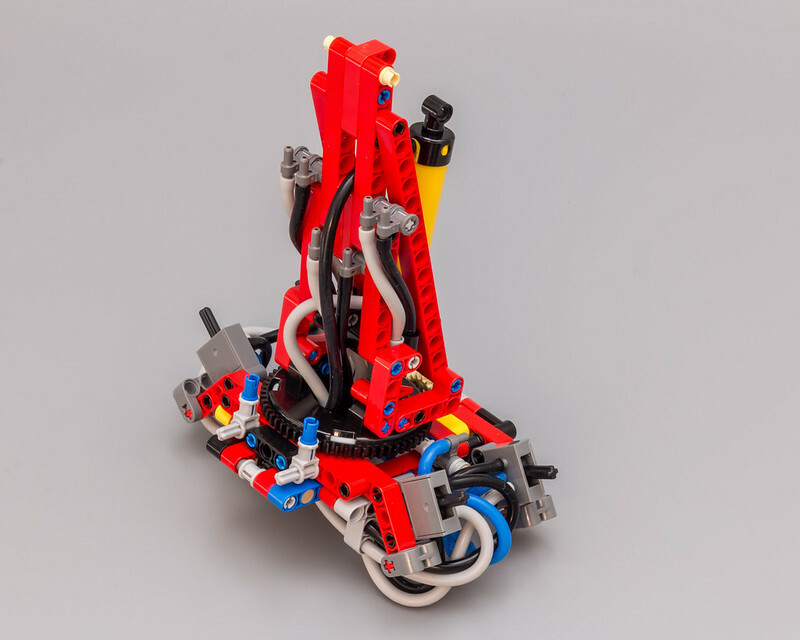 After building the rear-end of the chassis, you will be merging it to the front-end of the chassis. This was the point where I needed to move my camera backwards a lot. The model is growing big. 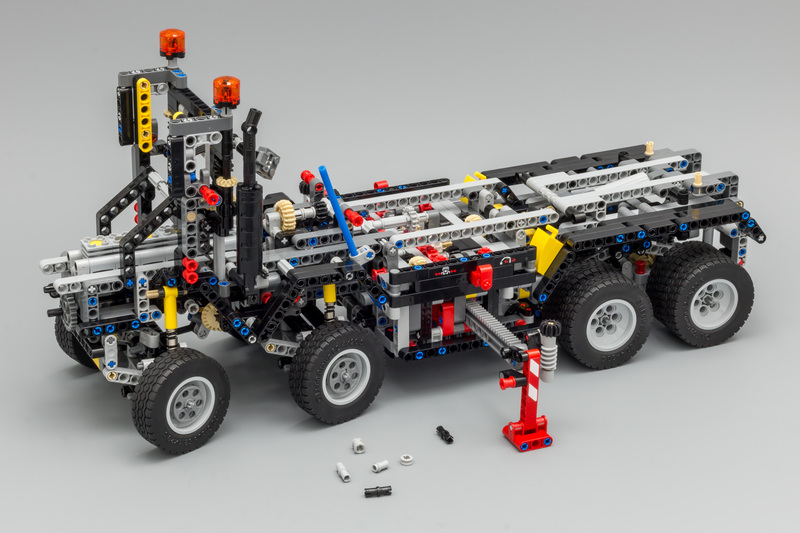 Double rear wheels on both axles, suspension and two live axles is quit a feat, especially regarding the limited available space. For me this stage was the turning point in the build. From now on you actually see the impressiveness of the model. Only two bags are provided for this stage, but it still took me quite some time. Connecting the pneumatic hoses does take more time than simply adding connectors. This stage did offer a variety of new parts, like the Pneumatic V2, new Turntable and the two Clamhell Buckets. Pre-cut hoses are quite convenient. The instructions clearly show which length you will be needing. 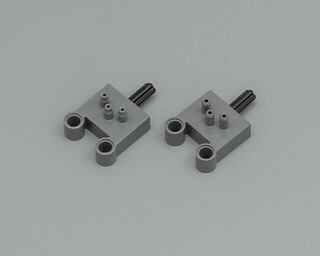 There's little difference between 216mm and 240mm so watch out. 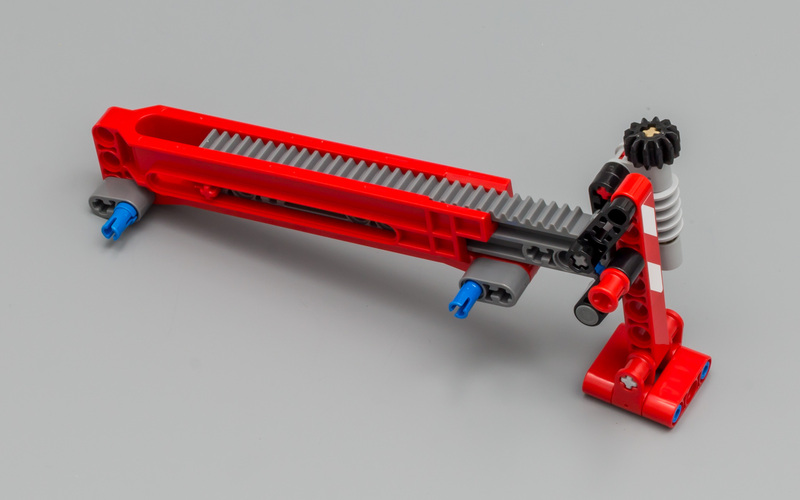 The new 60 Teeth Turntable is mounted on the base of the crane. It turns a lot smoother than the old version. TLG really nailed this one! 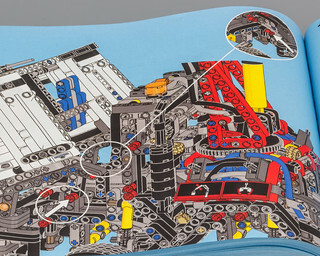 The bottom view of the crane shows lots of tubing, which will add difficulty when you connect the crane to the chassis. The tubing is touching one of the gears, so you need to push the hoses aside. There's quite some stress on the hoses, so it can be difficult to get everything into place. 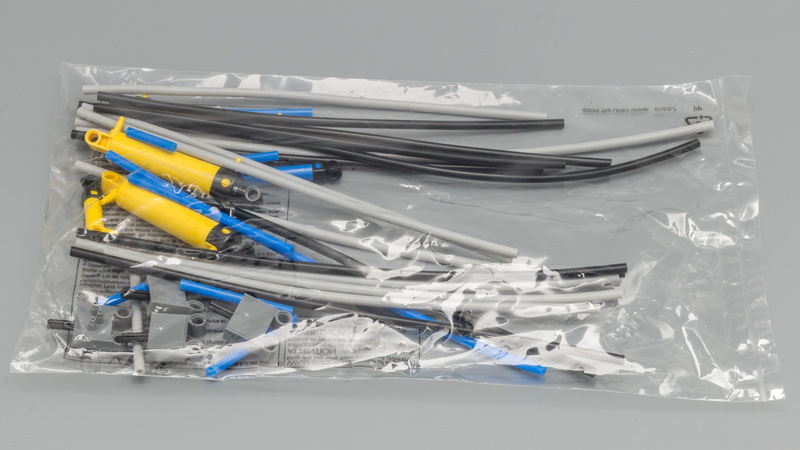 A lot of Pneumatic Hose Connectors are used to guide the various tubes alongside the jib and booms. 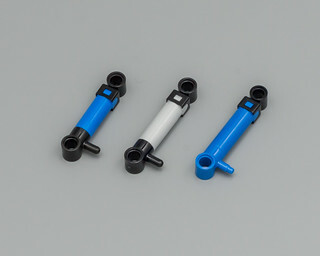 Instead of using a single longer hose, the sections are linked together using these connectors. 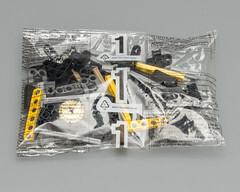 The picture below shows the complete crane assembly. 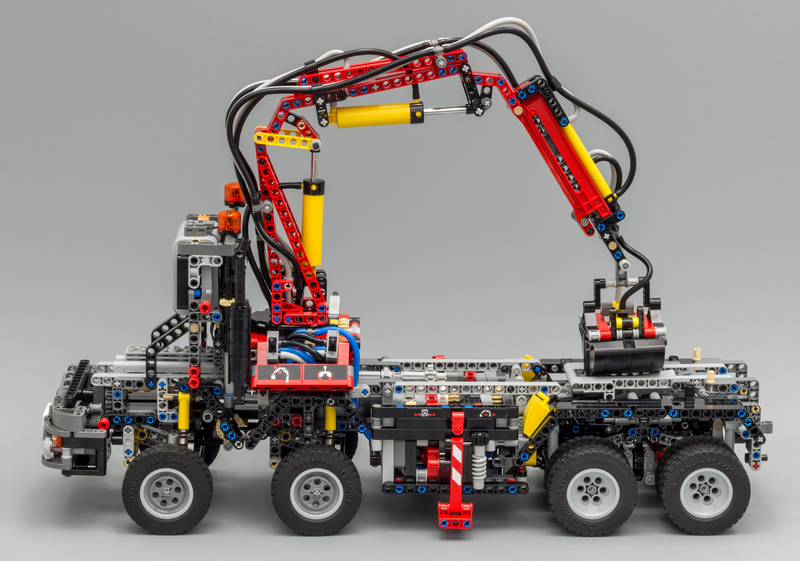 Normally I am not the biggest fan of pneumatics or building the crane on a truck, but I had a lot of fun building this one. 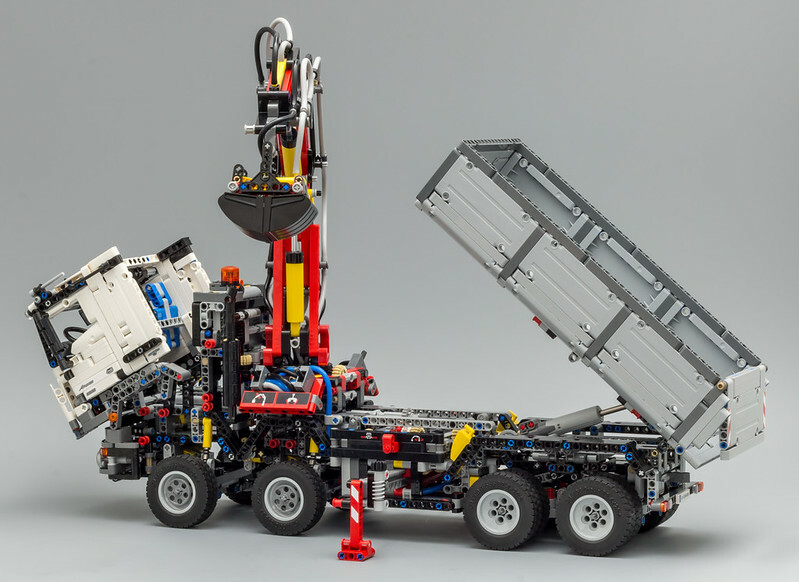 Not sure why, but the size of the crane is very impressive and the techniques/parts used are pretty cool. Stage 5 is the longest stage in the build. And it's probably the most rewarding, since you will see the truck come to life. You start by building the front bumper. The rear view shows how the slanting grill is achieved. 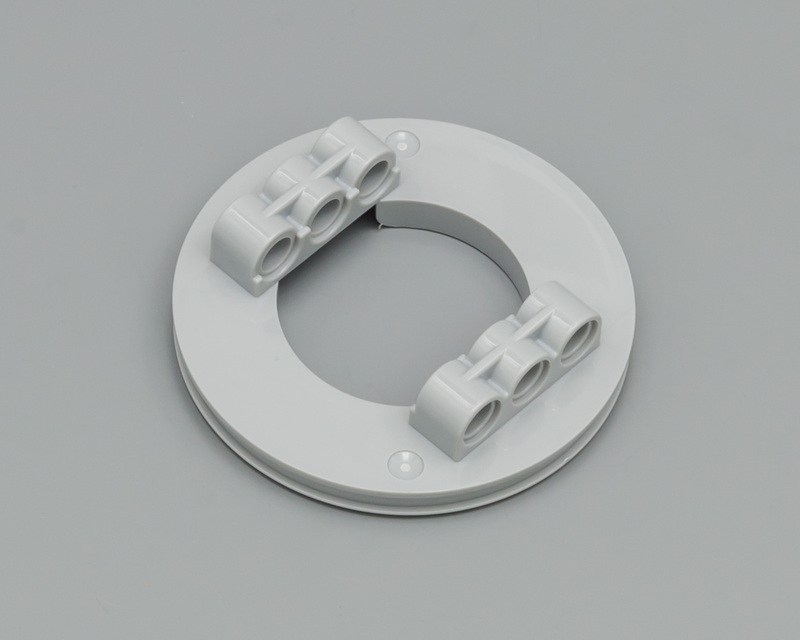 The name Kossmann is clearly visible on the plate, making no mistake that Markus Kossmann designed this model. 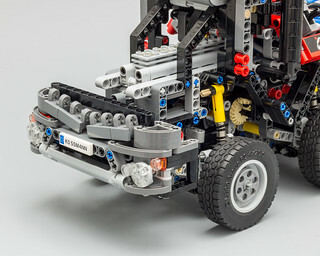 The front bumper is connected to the chassis by simply using connectors. 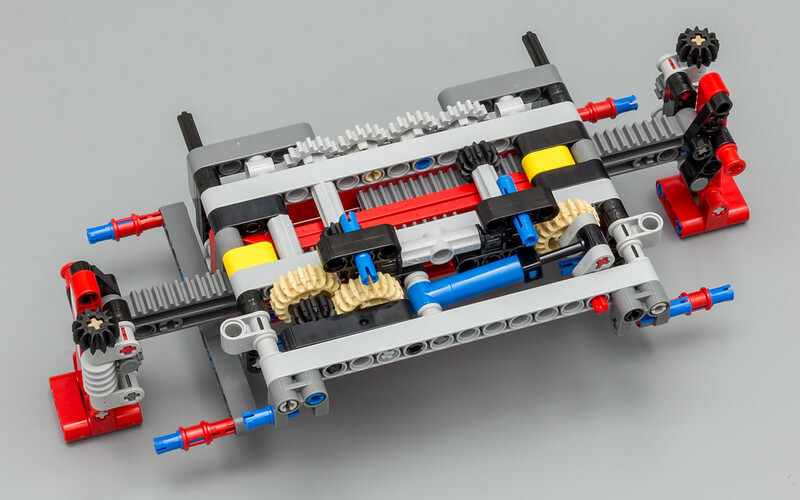 The axles with the gears are sliding into the 7L liftarm, keeping them in place. At this point the chassis with crane is mostly done. You only need to add the rear bumper, before you can start building the cabin. 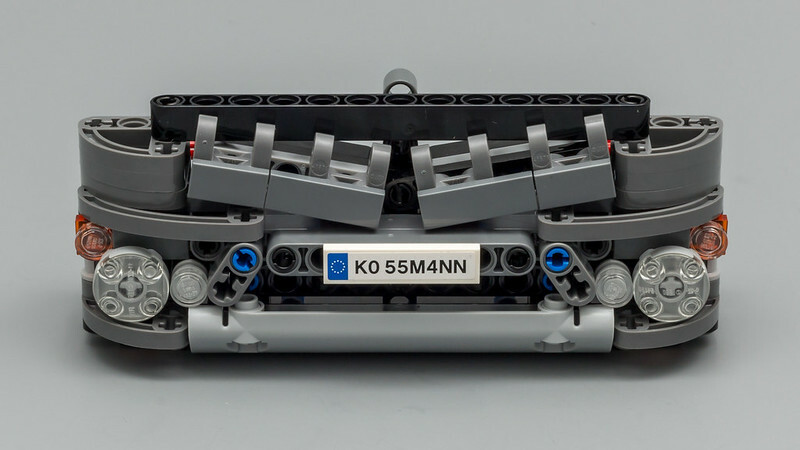 The cabin grill is comprised of lots of Perpendicular Double Split Axle and Pin Connectors. I really like the design of the seats, because of its simplicity. The printed Mercedes logo adds a lot of value to the cabin. Here you can see another mistake I made with the pin connector. No way the steering wheel will fit like this. The Mercedes introduces two new white panels. 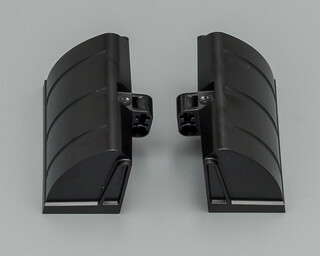 They are used as "cab side edge turning vanes", which improve aerodynamics. There was some discussion about the looks of the cabin, but seeing it in real life, I can only draw a single conclusion; this cabins is one of the most beautiful cabins LEGO has ever designed/released. The front view is stunning! Here you can clearly see that I accidentally moved the head rests and didn't return them to the proper position. You will see this discrepancy returning in multiple photo's. I found a mistake in the manual, which can be somewhat confusing. 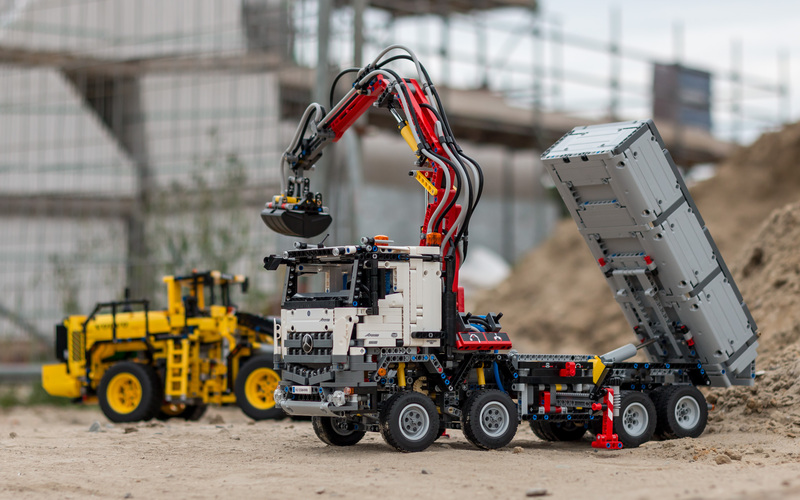 I didn't look at the image when connecting the cab to the chassis, but when I did take a look when I was shooting pictures, I noticed this small flaw. The circle with the arrow, doesn't match the outlined image on the right. The circle with the arrow needs to be placed lower than its current position. 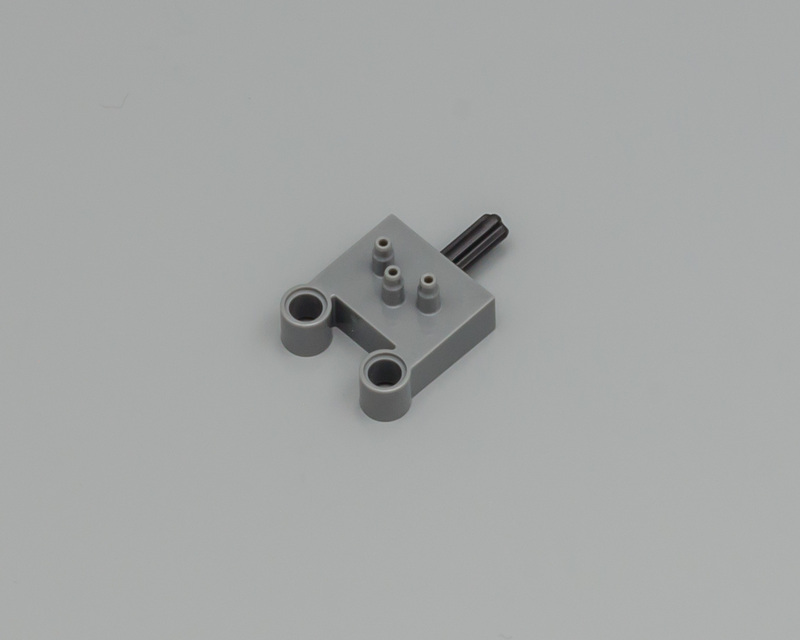 Here you can see the tilting mechanism on the actual model. Front view of the cabin and grill. It does make you wonder whether this could have been the right moment to introduce a Dark Bluish Grey 11x3 Curved Panel. 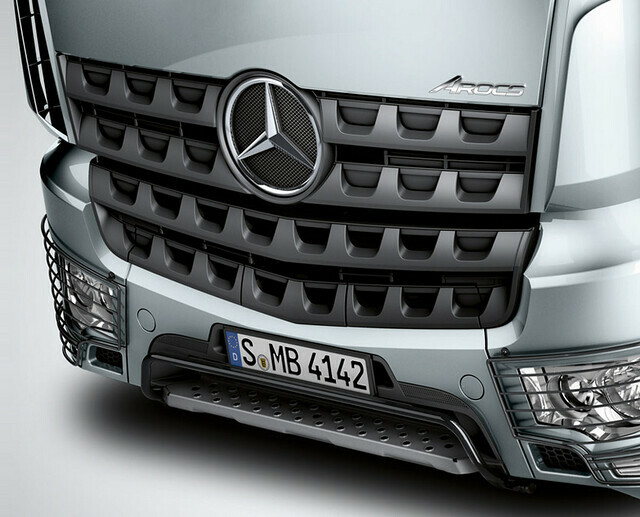 The front is instantly recognizable as a Mercedes. Obviously the Mercedes emblem helps a lot, but without the star it would have been clear too. At first I wasn't too happy with the white and dark bluish grey color scheme, but seeing it in real life makes a world of difference. Here's a picture of the actual cabin. 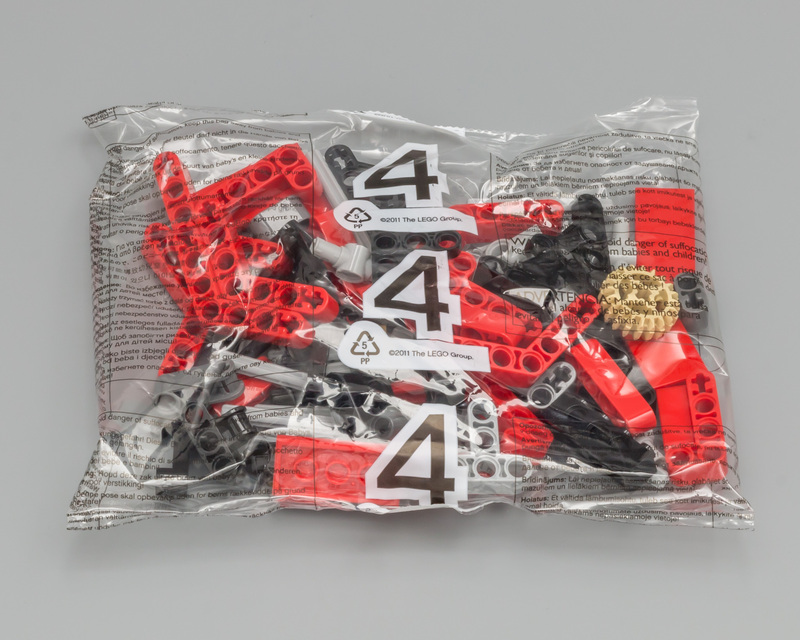 The main difference is that the LEGO version only has three bars, instead of 4. I can live with this. The bottom front section of the cabin seems to be some sort of metal, so maybe Markus was right by using the light bluish grey panel. The radiator grille designed in a bucket tooth look lends the Arocs a striking, unmistakeable face and underlines its power and robustness. The leftover parts, I forgot to add to the previous shot. This is by far the easiest stage of the build, consisting of mainly grey panels and liftarms. The intersection shows the simple construction of the tilting bed. The finished bed looks....well uhhmm grey. A cool thing about the tipping bed is the lock at the end. This locks the tailgate of the bed to prevent cargo falling out. After 10 hours of building the model is finally finished! 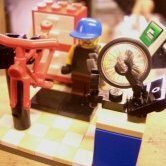 I reckon most of you will do this in 8 hours (or less), if you don't rush the build. Markus delivered a great looking model, which is even more impressive in real life, than in pictures. As you can see in the picture below, there is quite some strain on the base of the crane assembly, where the pneumatic switches are mounted. Some of the hoses at the base can probably be cut a little shorter, to save space. 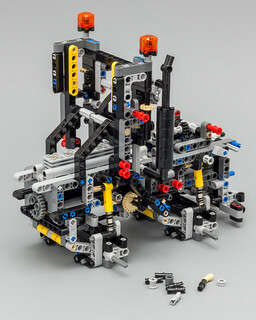 The bottom view shows the entire chassis, with suspension, steering and drive train. Some of you said the wheels are too small and there's too much space between the wheels and the arches. Looking at pictures of the real Arcos, the second front arch, could have been placed a stud lower. 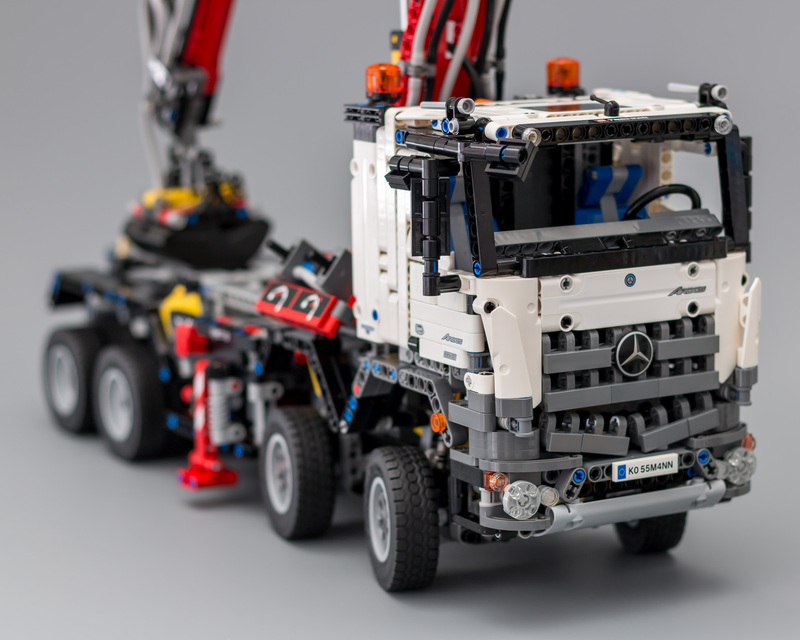 Those minor details set aside, the finished model resembles the Arocs a lot! Even the rear view gives you the feeling you are looking at a real truck. With extended outriggers and stabilizers and operating the crane. I forgot to put the wheel chocks between the rear wheels for extra safety. My reviews always contain pictures taken in a photo studio. Unfortunately, this doesn't do this model real justice. That's why I left my comfort zone and went out to shoot some pictures at a local construction site. A friend of mine is the manager of the site and he happens to be building his own new house over there as well. There's no better excuse to take the Mercedes for a drive in his natural habitat. And while we are at it, why not let the Volvo tag along for the ride. This set has quite a few features and functions. 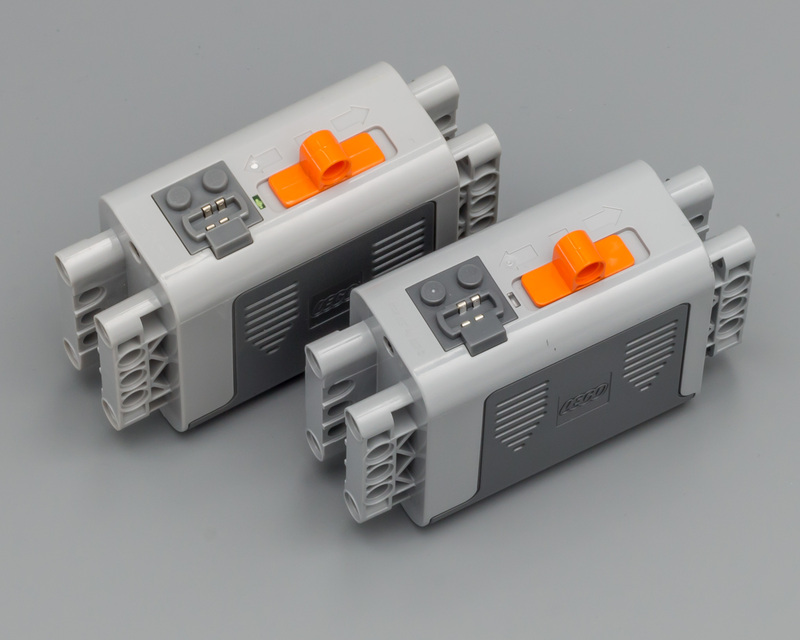 Controlling them is done by a combination of using the L-motor as a pump for the Pneumatic functions or by switching it to control three other functions. Switching is done by moving the levers on either side of the model. 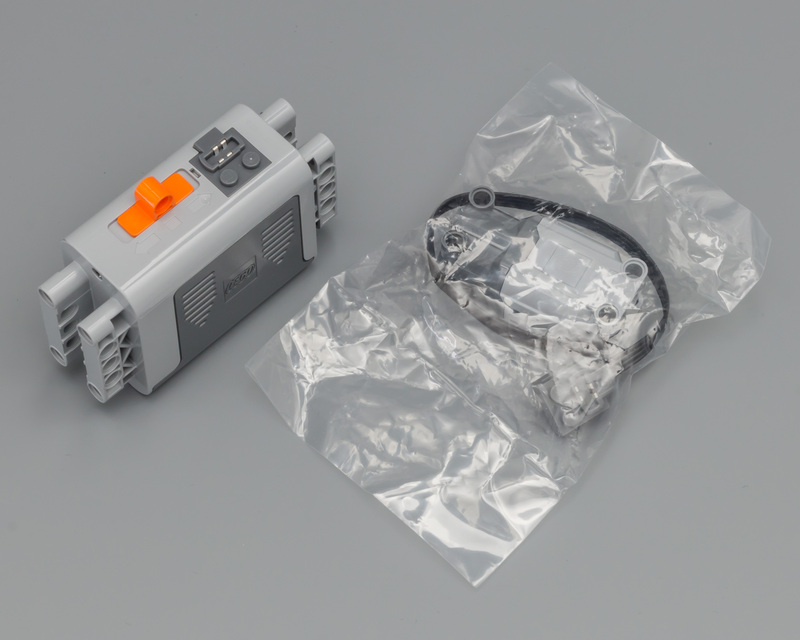 Reversing the function is done by the switch on the battery box. In the beginning this can be quite confusing. Since you are used to using a lever to switch between back and forth, I ended up switching between functions, instead of reversing the current function. It helps a lot when you manage to use the right switches and levers. All the motorized functions work perfectly. 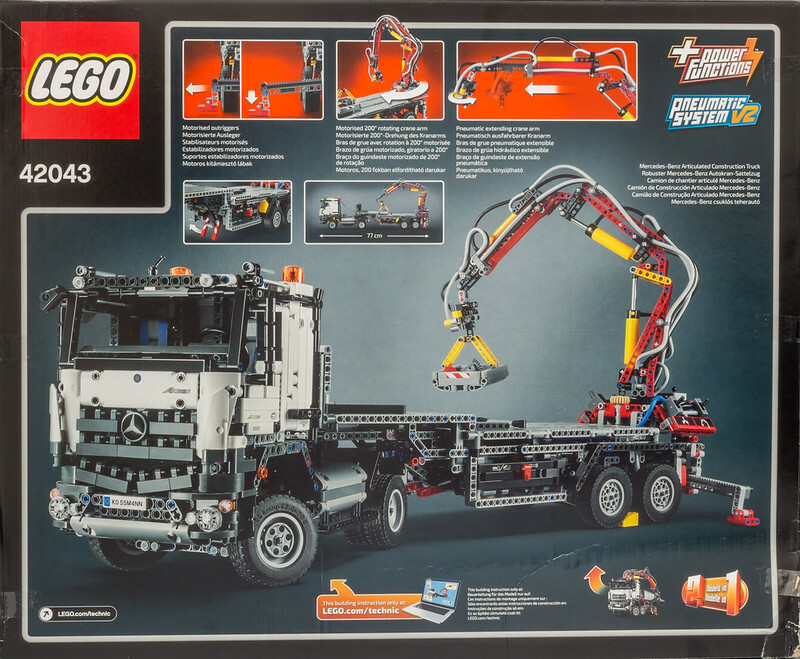 The pneumatic functions do work a lot better than the crane on the Unimog, with a side note that movement can be a bit jerky sometimes. This is caused by gravity or strain on the pneumatic hoses. Besided the incidental jerky movement, you can actually fully operate the crane, which is something you'd expect from a flagship like this. The video seems to be slightly out of focus. Sorry for that. As you can see in the video, I still need to find my way around the functions. 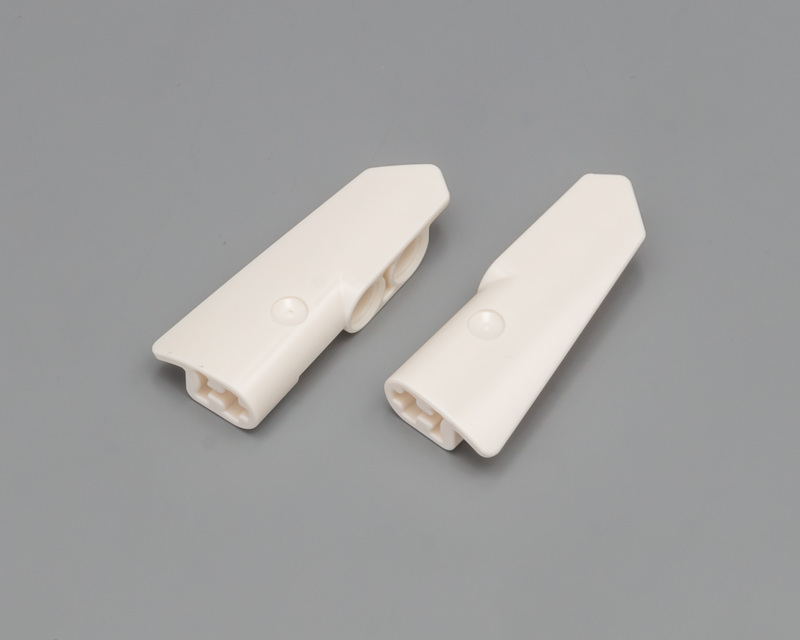 The jerky and sometimes slow movement of the pneumatic functions is also visible. 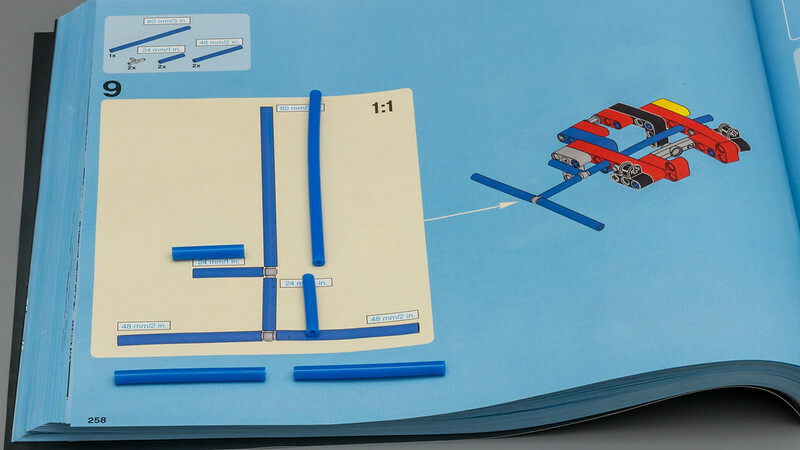 However, I still think the crane is as good as you will get using LEGO and Pneumatics. Lifting the entire crane simply requires a lot of power. All in all I am very pleased with the playability of the model. 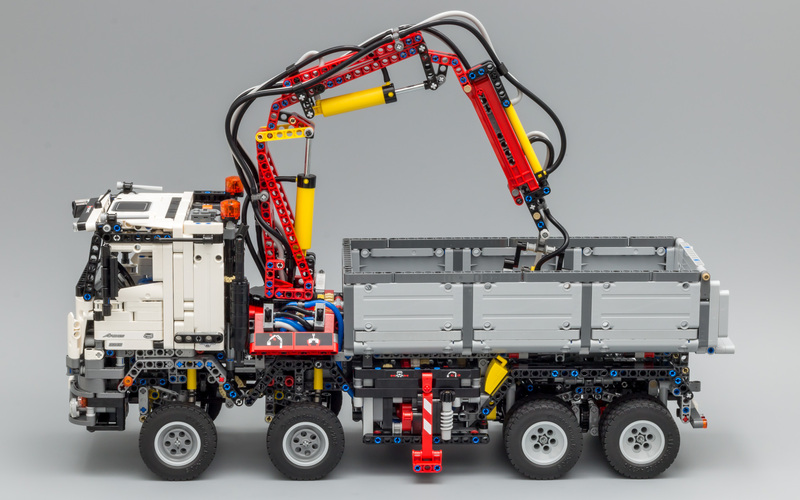 Here's an extra image, showing the truck with the cabin and bed tilted. Since the building instructions are not available yet, I couldn't build the B-model. This appears to be a Mercedes-Benz Actros 1845, as you can see on the back of the box. The cabin has more or less the same design, but the chassis is different. Here we are, at the end of this review. 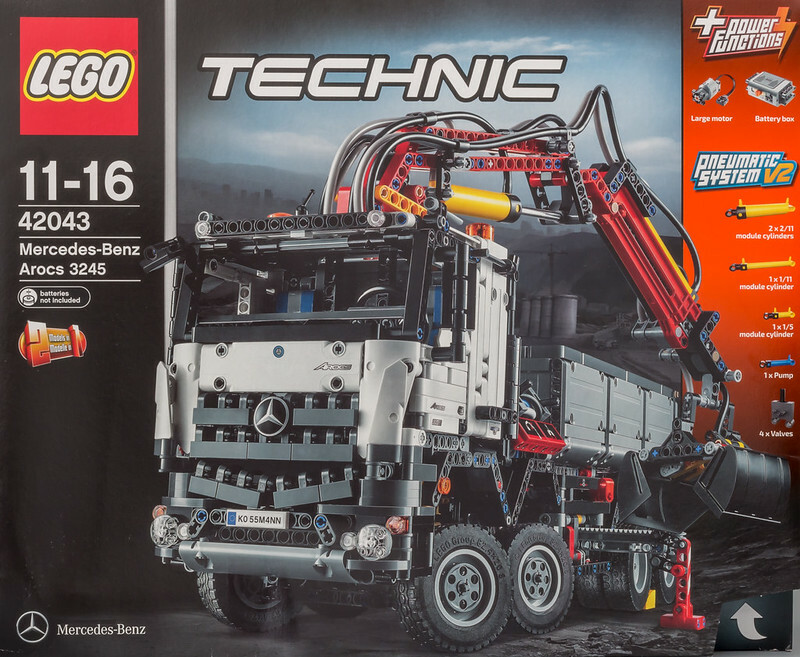 The main question I posed at the beginning of this review "Is this set better than the Unimog?" can be answered with a loud "Yes!". 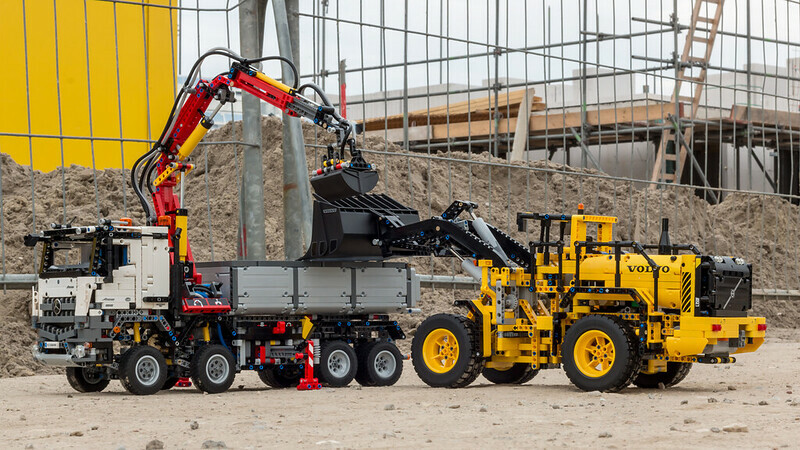 Your milage may vary, but the pneumatic crane is more advanced and it is working better than the one on the Unimog. There's no problem with the model leaning to one side and steering, although not perfect on this model either, works better than the Unimog. Which brings us to the obvious next question. 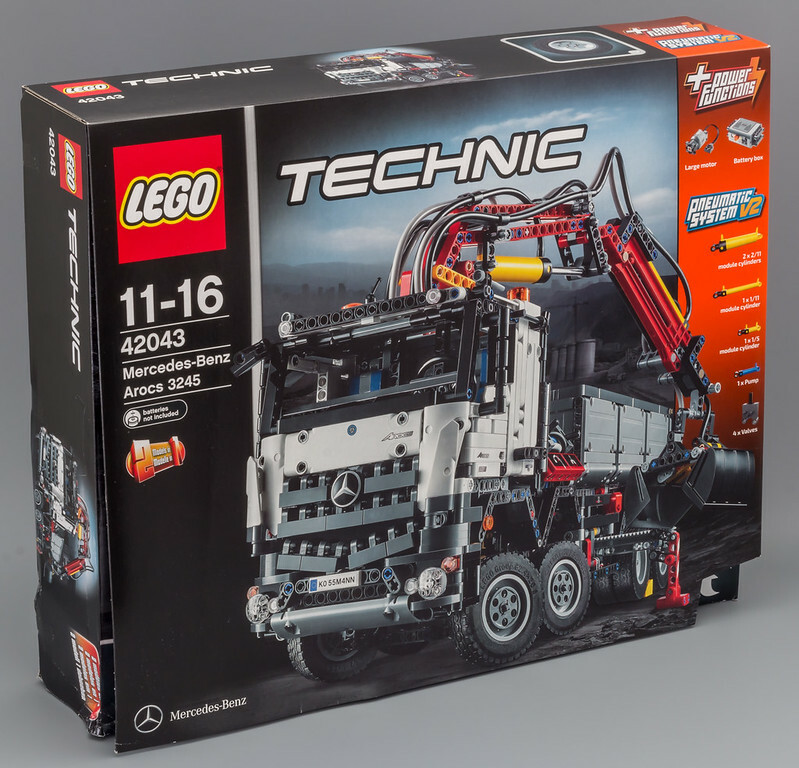 Is this set also better than the 8258 - Crane Truck? 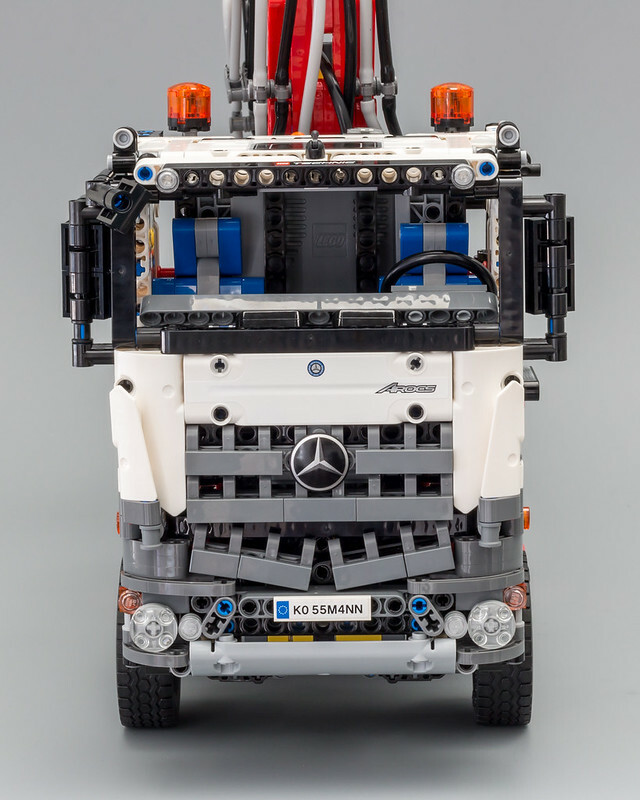 The 8258 is absolutely a fantastic set (probably the most highly acclaimed truck to date), but to be honest; I think the Mercedes just kicked it from the throne. 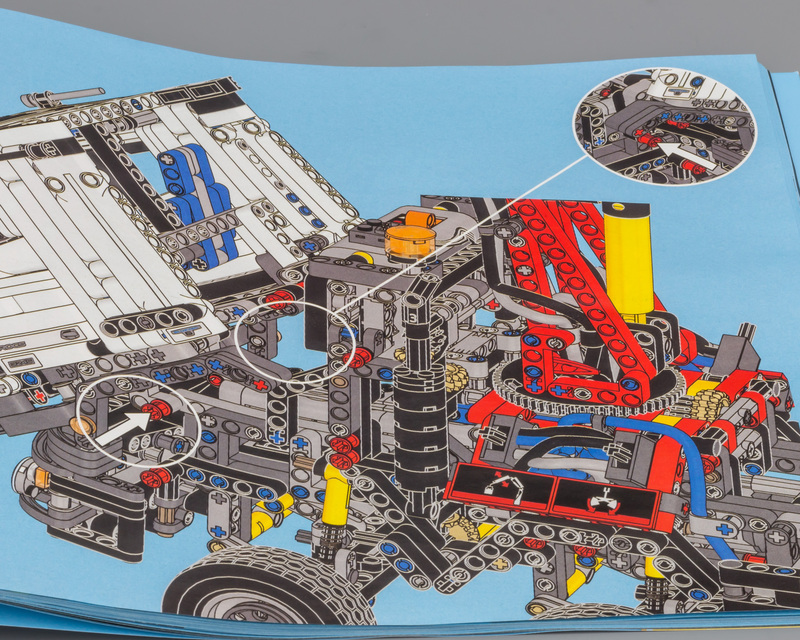 Without stickers, the 8258 doesn't look nearly as good as the Mercedes. 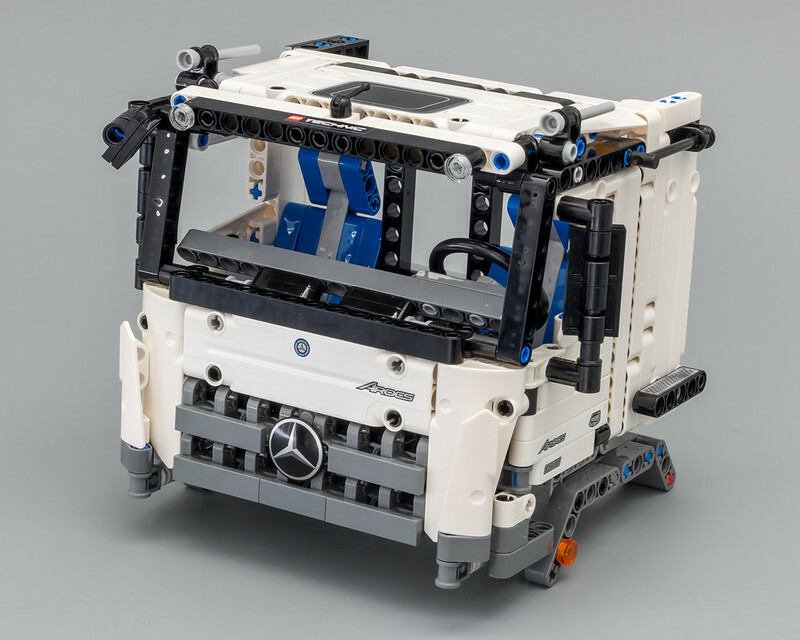 Add the ongoing list of functions to the mix and the only possible conclusion is; the Mercedes is the best LEGO Technic Truck TLG has ever released. Aren't there any negative remarks? Of course there are, but they are minor. 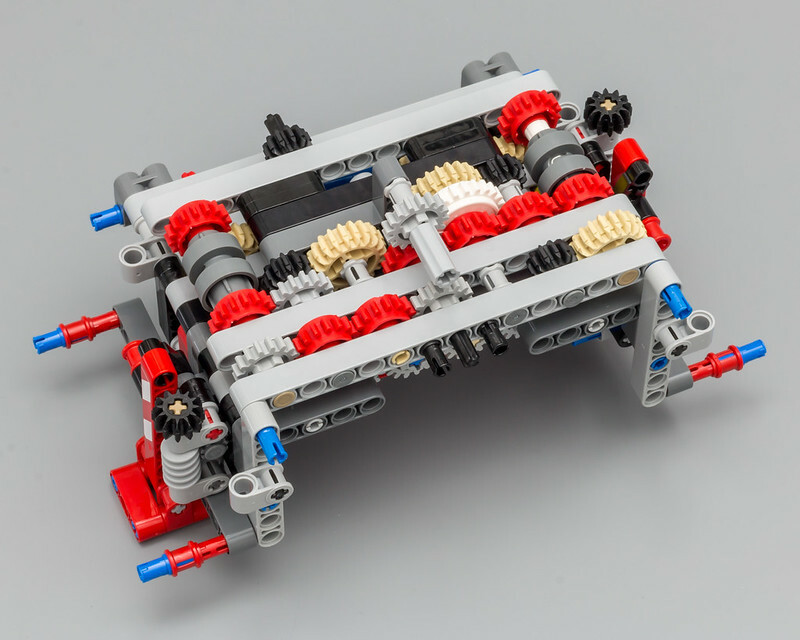 Because the steering mechanism uses more gears than usual, there's more torsional strain on the axles. Pneumatic control of the crane can be a bit jerky or slow. 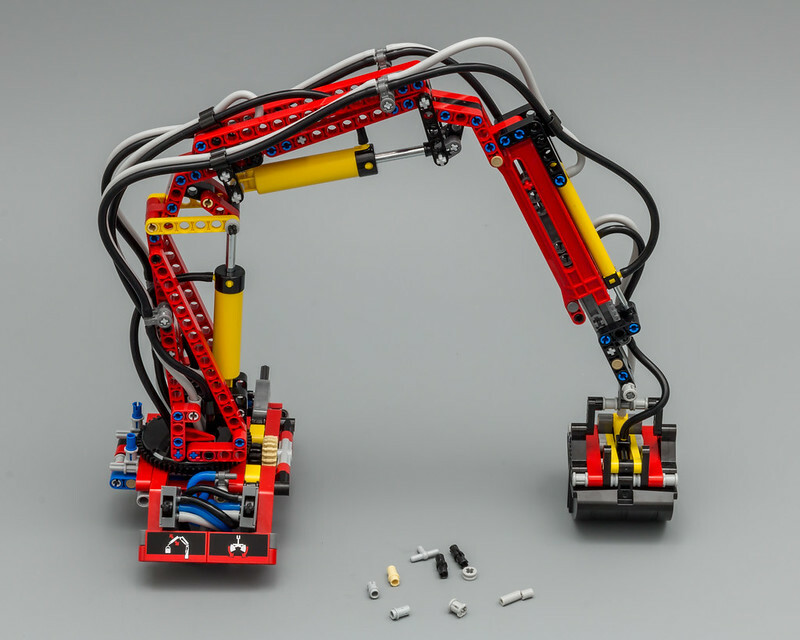 There are a lot of hoses between the switches and underneath the base of the crane, which requires applying some force when you attach it to the chassis. You also need to be mindful that the gear on the chassis doesn't touch one of the hoses. 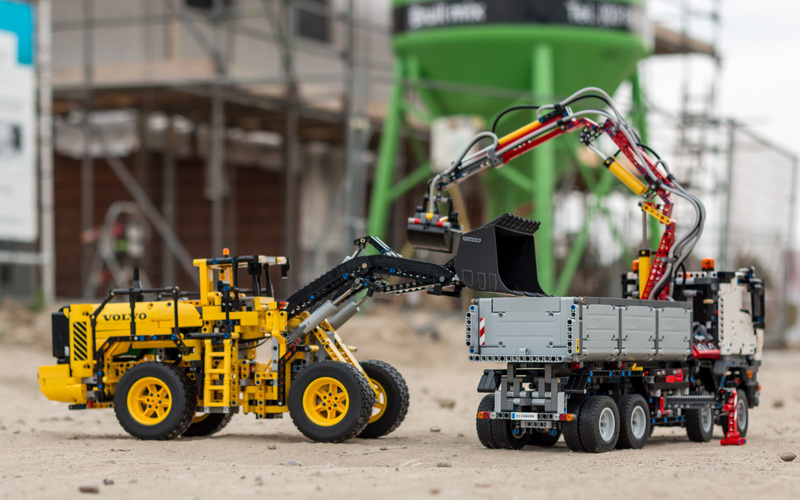 The last question I need to ask myself, is this set better than the Volvo L350F or the 8043 - Motorized Excavator? I'm not sure about that, but I will conclude this review by saying that the Mercedes did land a spot in my Top-3. 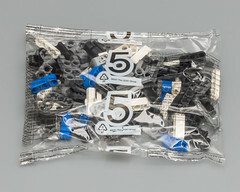 How do I grade this set? Resembles the real deal a lot. The model grew on me during the build. Packs a ton of features. 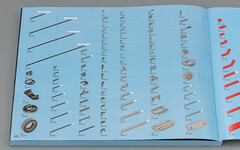 Pneumatics V2 and lots of other interesting parts. You get a lot of Mercedes for your money. Thanks for reading and feel free to ask questions! More pictures can be found on my Flickr page. Okay, here we go! Hope you enjoy this review. 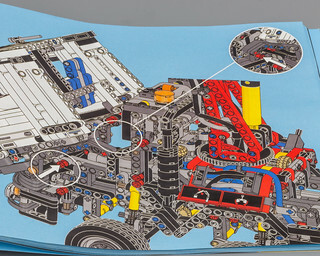 This set really reminds me of 42008 in how the functions work together. 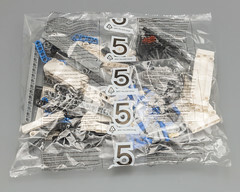 I only want its new pieces, It is awesome but I have bricks enough. Really nice review. 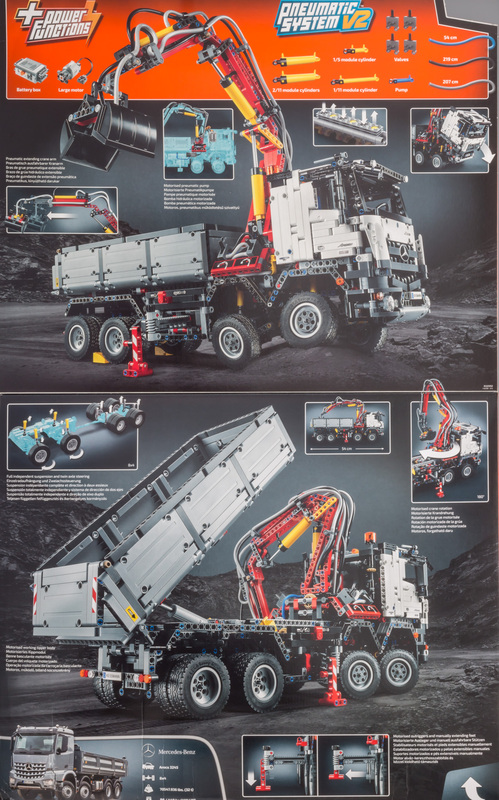 Outstanding photos, and while I appreciate the studio shots for their detail, I think the truck looks better in the outdoors shots. 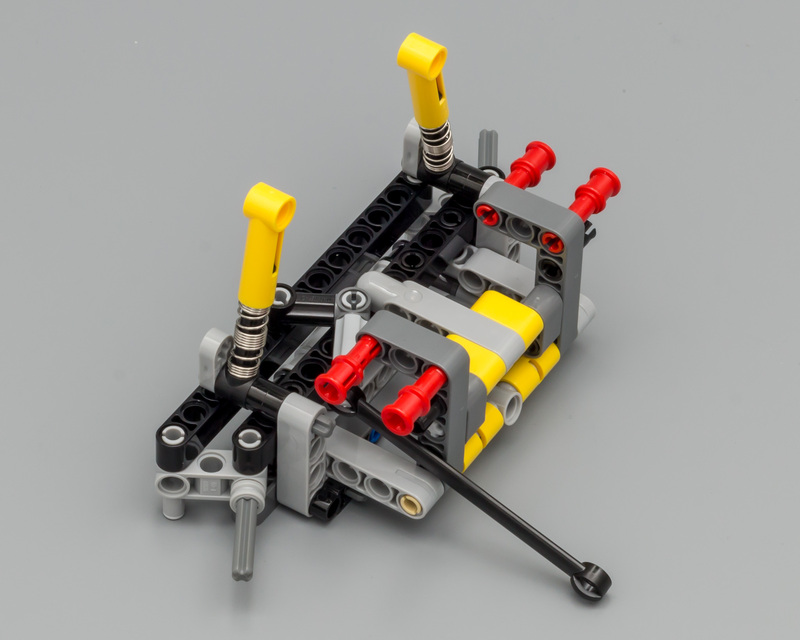 The steering system looks really clever, especially because it's so simple yet ( seems) very reliable. My attempts at building link-steering systems for a truck did not fare so well. 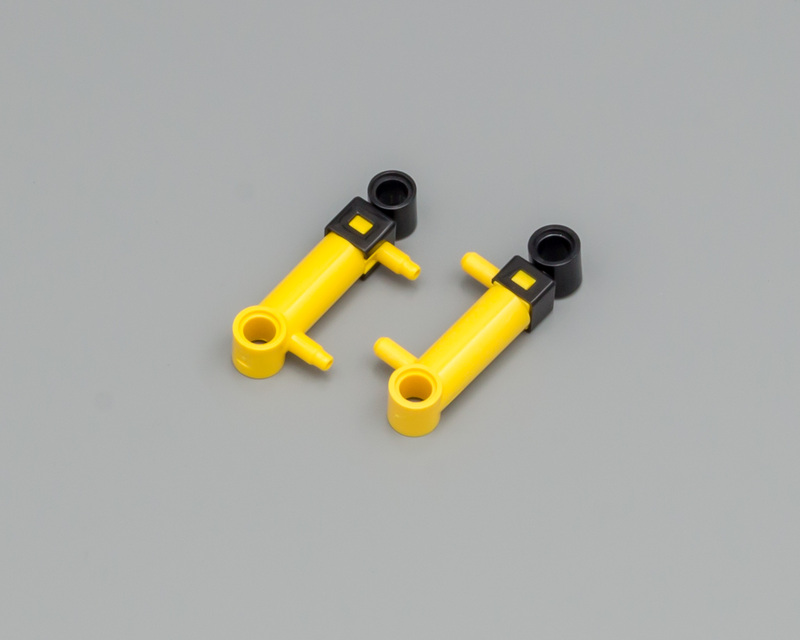 Also Jim, the purpose of those flexible rubber connectors is to allow the upper pivot points of the 4 steering arms to slightly move in towards each other when the suspension is compressed. I don't know if that made sense, I'm not very good at explaining. The rear suspension would not work with completely rigid pivots. Arrghh I NEED THIS NOW I'm pretty sure that they're releasing this set in September here so I have to wait for another two months yet, but it will we worth it when I walk into Toyworld and put in an order for two of them Good review Jim, you have confirmed all my hopes in this set. Sariel is posting his reviews at midnight California time and if I remember correctly that's in 6 hours and 15 mins. EDIT: It's 8 hours and 15 mins. Absolutely fantastic I cannot wait to get this set. Great photos as well . Absolutely amazing review! The time you put into it really shows/reads! The photos are beyond superb! 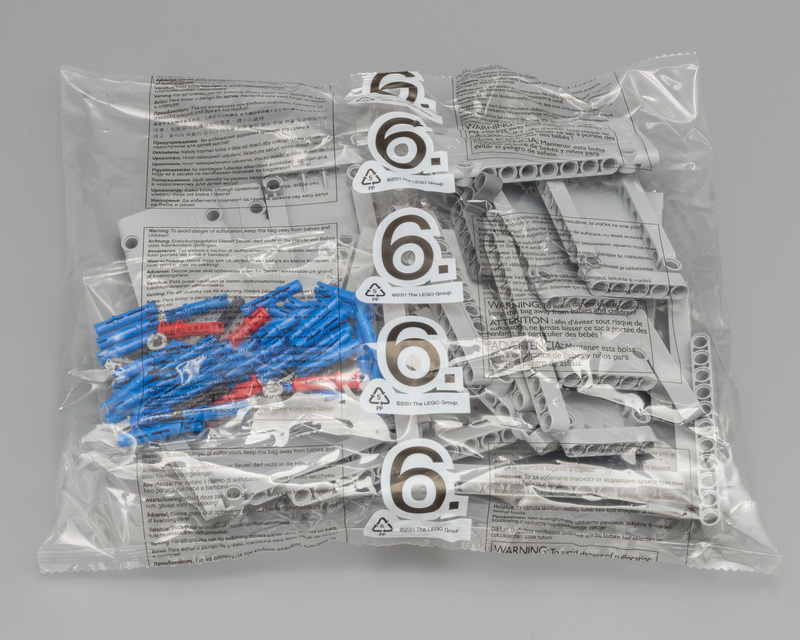 The set seems to be pretty much as expected, will definitely buy a copy, mostly for the parts! 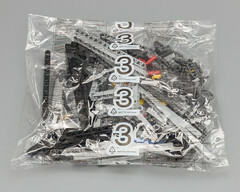 Then to wait for the pneumatic parts to be available in the online Lego store! Your reviews never cease to amaze, incredible job as always Jim! Quick question: How sturdy is it? Obviously, being from TLG, the chassis is ridiculously sturdy, but are there any parts, like the bumpers or the cabin that feel a bit loose? I just want to know, even though I'm probably not getting the set (way out of my budget). 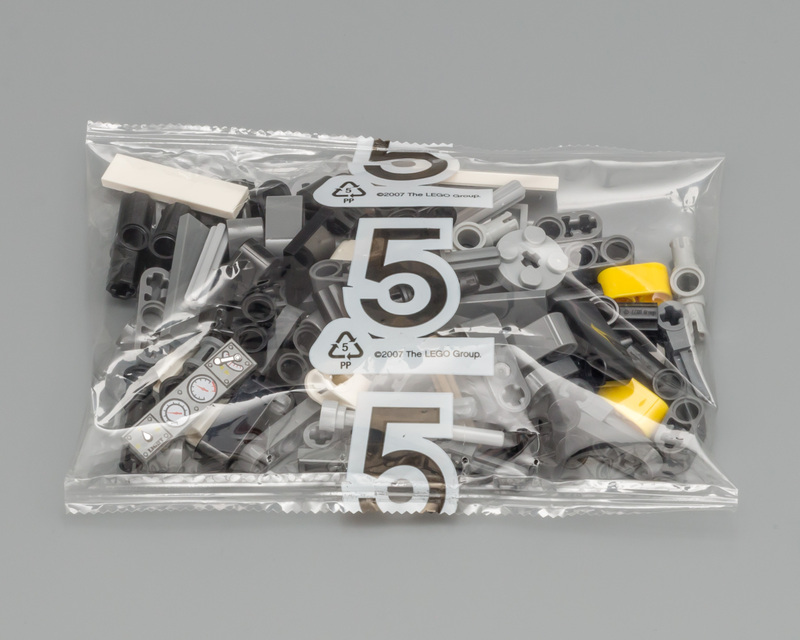 Nice review, very keen to get my hands on this set. 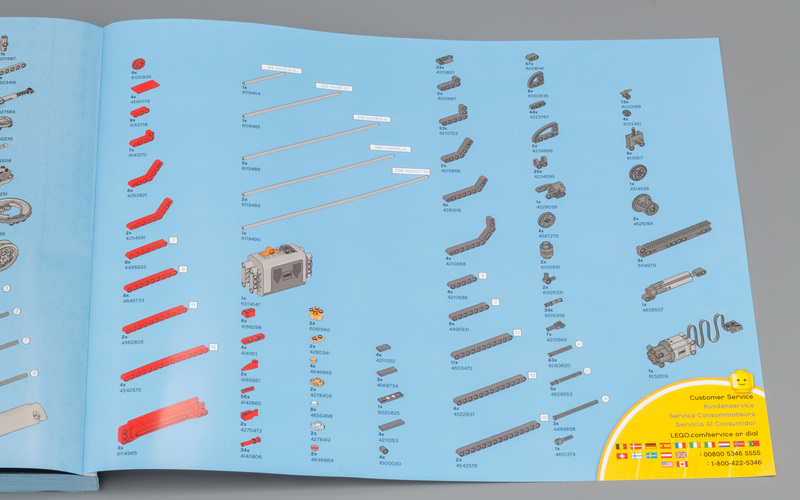 I don't understand why the Lego Design Team keep doing this thing where you build something awesome... And then have to end that experience with the dullest part of the build. Excellent review, Jim. This is definitely a buy. this will be a 1st day buy for me. hope i can find it locally great review! Thanks for the review Jim! Great review and fantastic pictures. 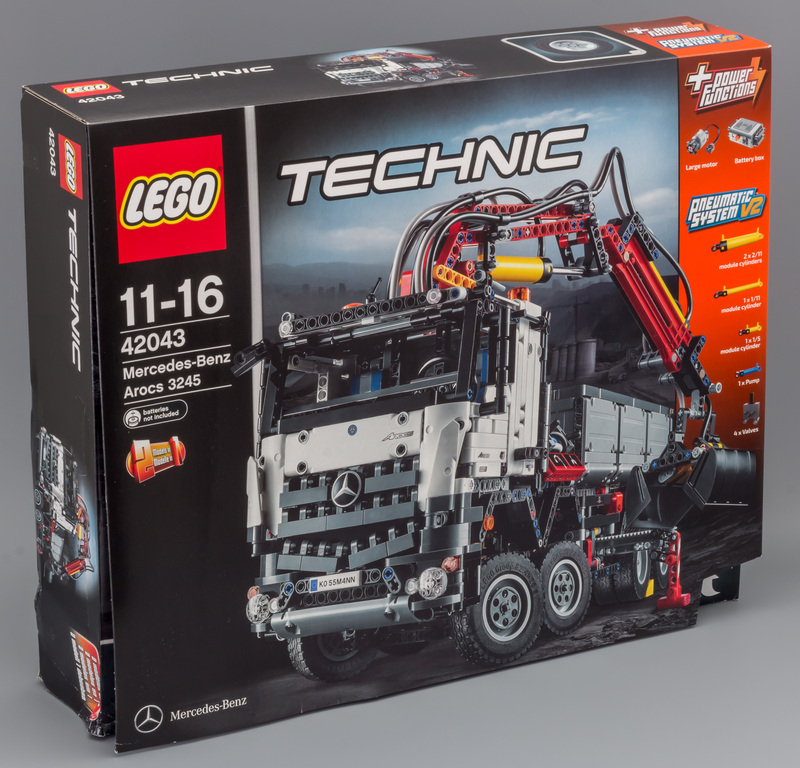 This set looks amazing! 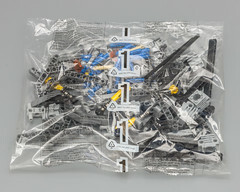 I'm looking forward to building this. It looks like the suspension design has some compromises, but considering the small amount of space, I'd say it turned out nice. The new turntable will come in handy, and I really like the longer pneumatics. Those will be useful on one of my current projects. Friggentastic! I honestly was on the fence about this one, but it looks like it's going to make (another) hole in my wallet. When will it be available in stores? 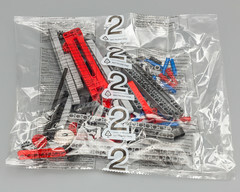 Nice review and, of course, really nice pictures I like your pro style to take care of business with these reviews Really cool and nice set with lots of cool functions and new pneumatics I still think though at this stage of my Lego Technic hobby, maybe I dont buy it just yet but don't get me wrong it is at least a 9/10 Thank You Jim, you are the man! 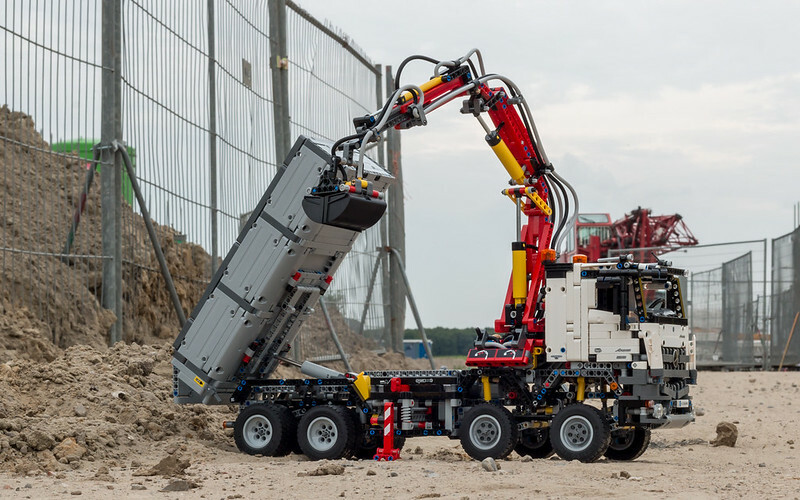 I so do want to use the 1/11 cylinder in a 4-wide heavy-equipment model (16-axle mobile crane) and the 2x2/11L in a 6-wide model (a mix of this one and this one, but with more axles), but I worry about the integration of the cylinders, the valves, and the pump, especially in 4-wide. Do these cylinders work on their own? And will they break when they do so? Those new turntables. They'll be some most-wanted parts, but if they show up in more sets... well, why not? Pure intimidation on the last construction-site shot. Would be mistaken for the real thing. It rocks. Expensive, yes (I need more scratch cards! ), but seriously, Jim, make this a family heirloom, one that can be passed to future generations. I have been waffling on this model since the initial pictures were released. Upon seeing them I was excited to get it, but recently the excitement has waned. 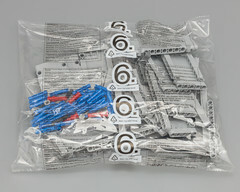 This review spiked it again, and I will definitely get this set. Thanks for spending so much time and effort on this presentation; it's excellent. Another excellent review from you, Jim! Your review has reaffirmed my urge to buy this set. Another fantastic review Jim. Your quality is some of the best out there and I love reading these reviews. It seems like the rubber connectors over the rear axles were used to allow for the fore/aft flex of the steering arms as they move through their travel. 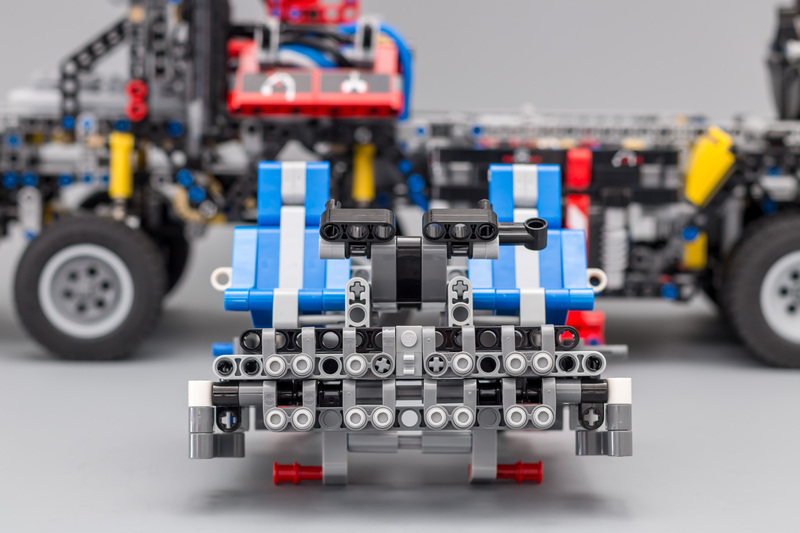 Since the two rear axles are connected together something had to allow for this flex.